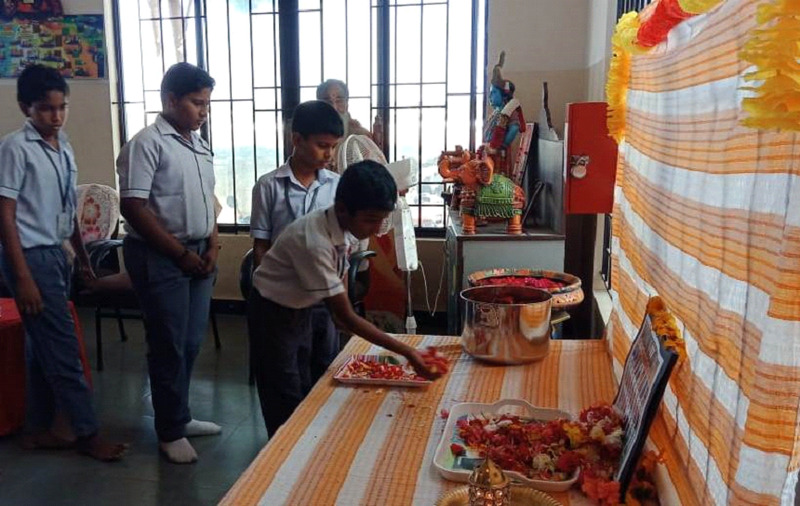 A tribute to the 40 martyrs, who laid down their lives in the Pulwama Attack, was paid in our Vidyalaya on 19.02.19. 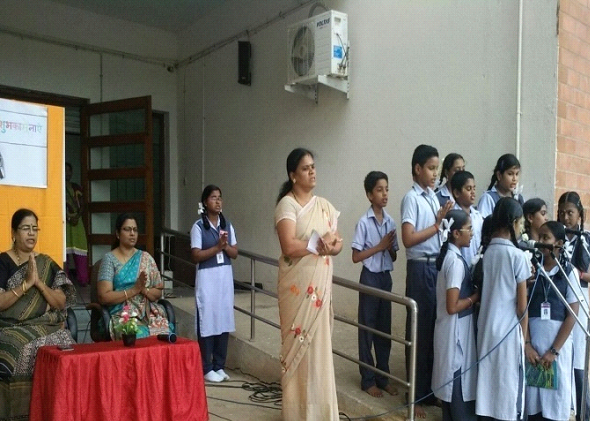 Shri.L.R.Yadav, Retd Deputy Commandant, CRPF, along with the students and teachers offered prayers to the departed souls and to the bereaved families. 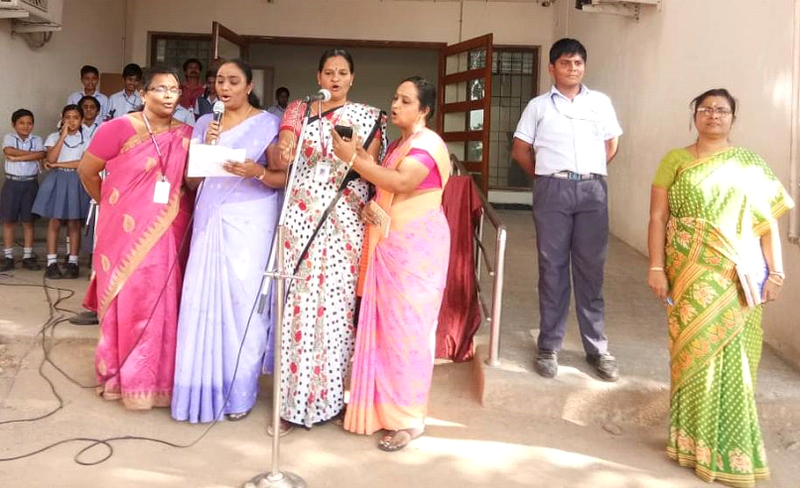 A rally on 13.02.19 on Oral and Maxillofacial Surgery Day (OMFS Day) was organized by Indian Dental Association in combination with Ramachandra Dental College and Hospital. 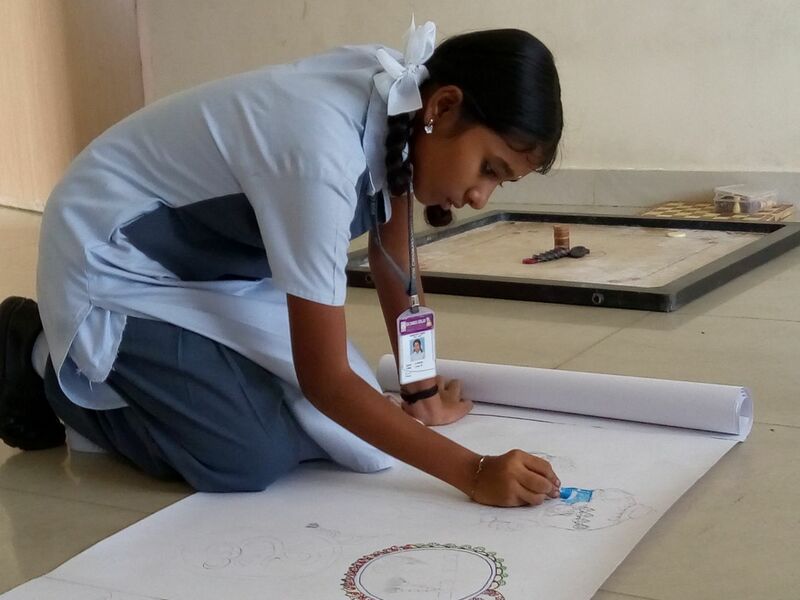 The students of our Vidyalaya of classes VII and VIII took part in it. 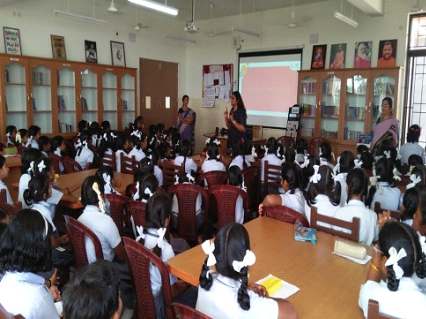 It was an Oral Cancer Awareness programme. 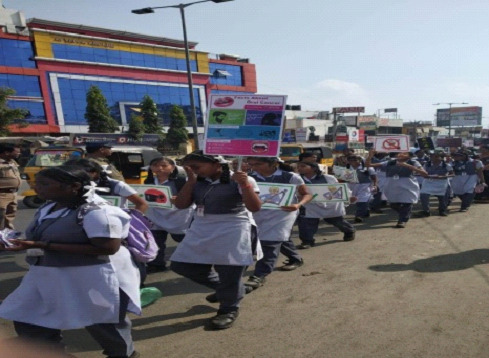 The purpose behind the rally was to create awareness about dental hygiene with the help of placards and pamphlets. 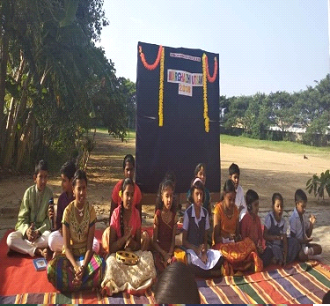 National Youth Day (Swami Vivekananda Jayanthi) was celebrated in our school on 12.01.19. 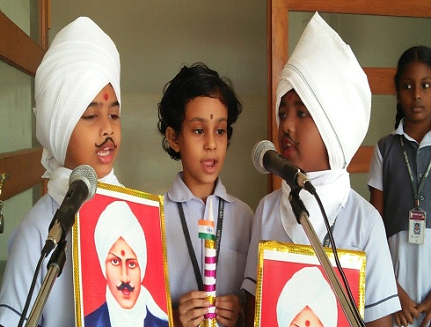 Children were given an insight into Swami Vivekananda’s life and the values passed on by him. 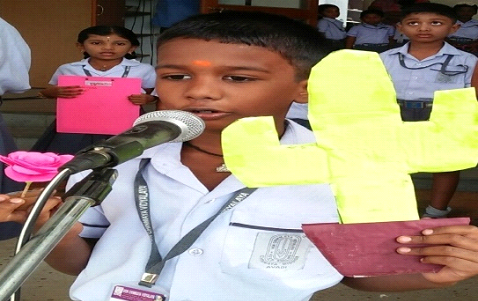 R.Rithesh of Std VII was dressed as Swami Vivekananda and led the students in taking the ‘Youth Pledge’. 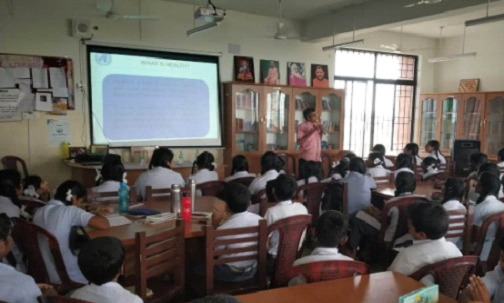 Life skill class for students of VII and VIII was conducted in our Vidyalaya on 19.01.2019. 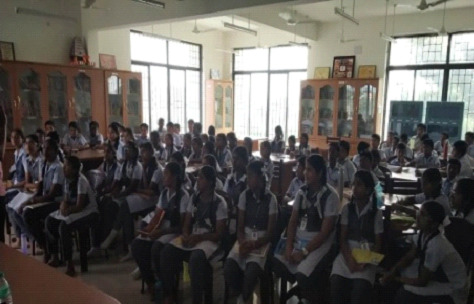 Shri.Desikan from the Chinmaya Mission, Chennai conducted the class. 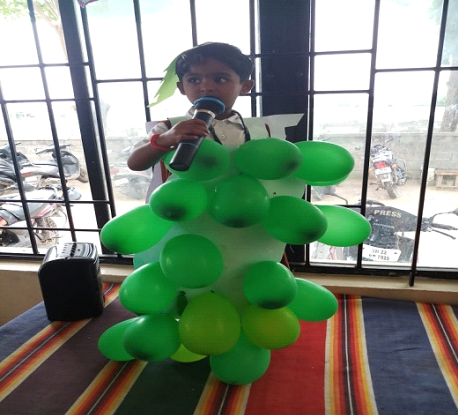 The theme of the class revolved around “Healthy food and healthy eating habits.” The class was made effective and interesting with the help of a PPT presentation. 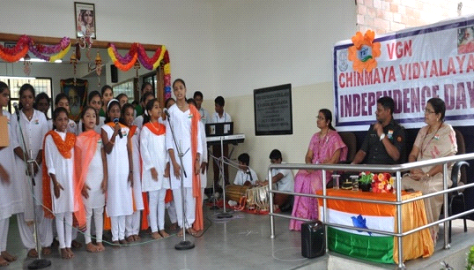 Chinmaya Yuva Kendra (CHYK), the youth wing of Chinmaya Mission aims to help the youth to discover the latent talents and infinite inner potential. 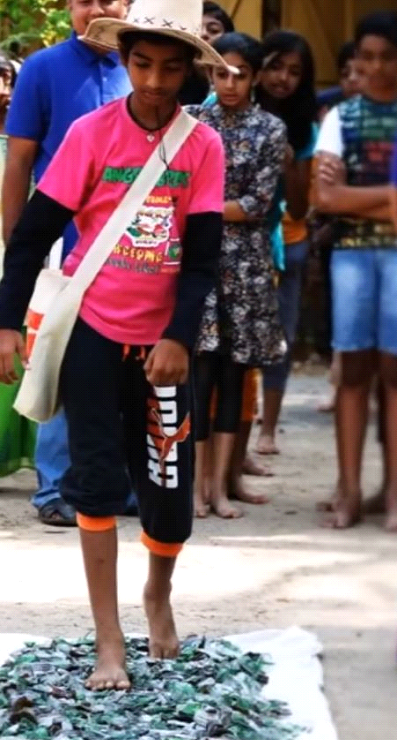 The Yuvakendra members shortly called as CHYKS take up responsibility with alacrity, assume leadership roles and show a confidence that belie their age. 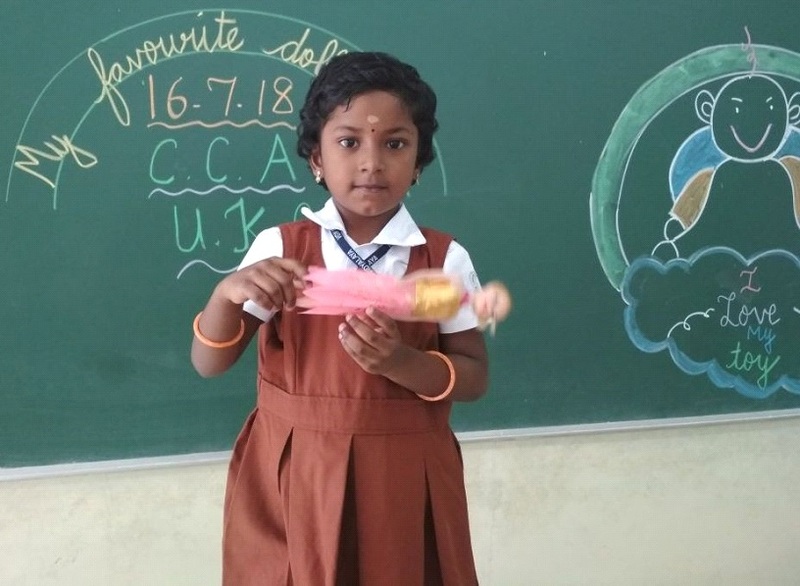 CHYK was inaugurated in our Vidyalaya on 19.01.2019 by Br. 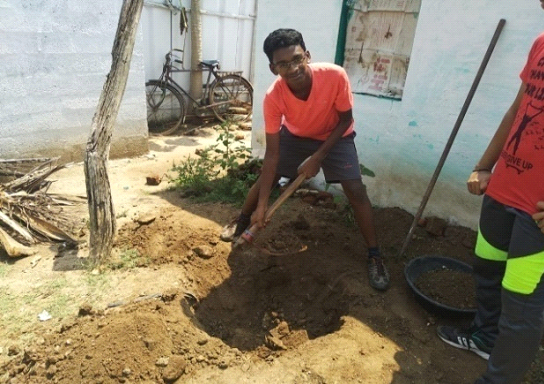 Anand Chaitanya. 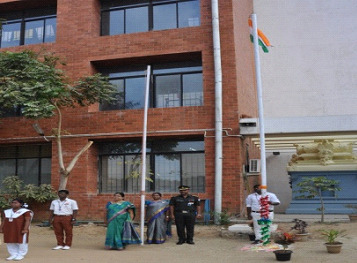 The 70th Republic Day (26.01.19) was celebrated with due reverence and observance. 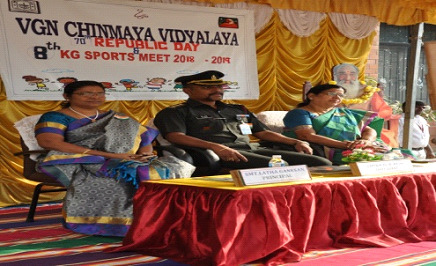 Captain Dr.J.Arun, CVRDE presided over the function. March Past and Culturals were the highlight. 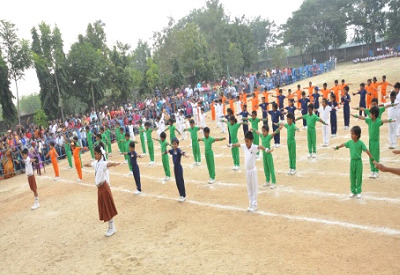 The Republic Day events glided into the KG Sports Day. 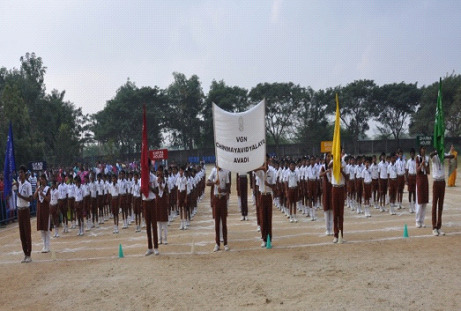 Mass Drill, Track Events, an event on National Integration and Prize Distribution made the program. 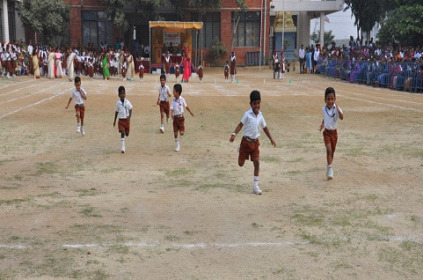 Our school witnessed its 8th Annual Sports Day on 09.01.19. 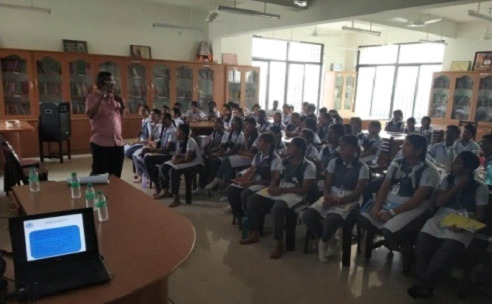 Dr.Natarajan IRS, International Athlete, IAAF Coach, Asst. 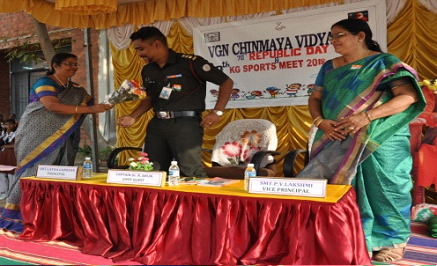 Commissioner of GST & Central Excise (presently) – the most veteran and versatile sports person was the Chief Guest. 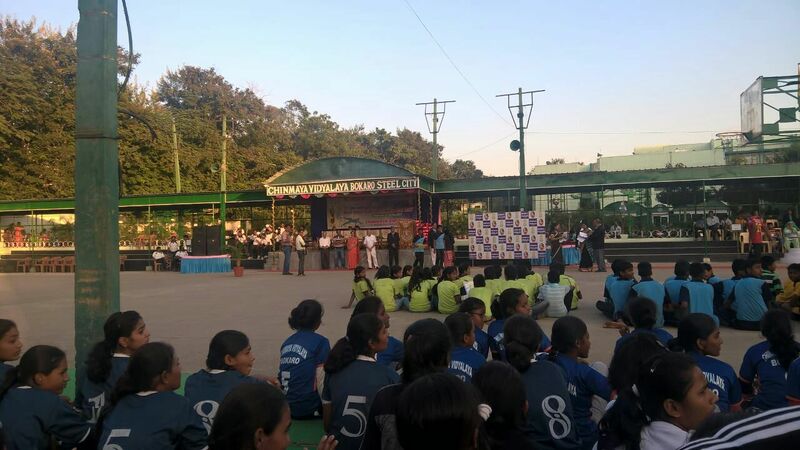 He gave a detailed talk to the parents on the importance of Sports and Games. 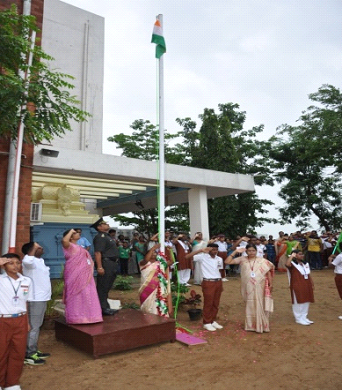 March past, Exclusive Yoga display, Mass Drill and Zumba Dance were the highlights of the programme. 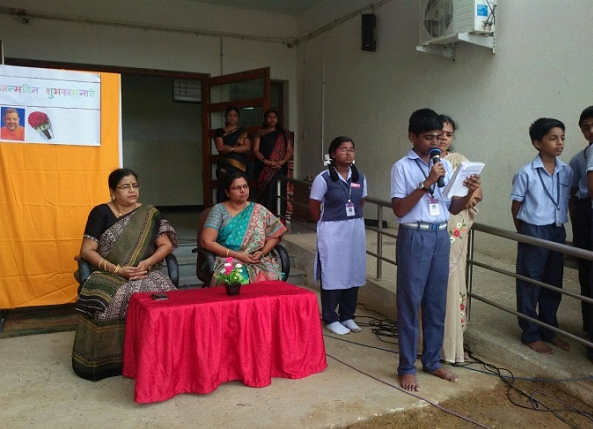 The event culminated well with the excellent co-operation of the students and the parents. 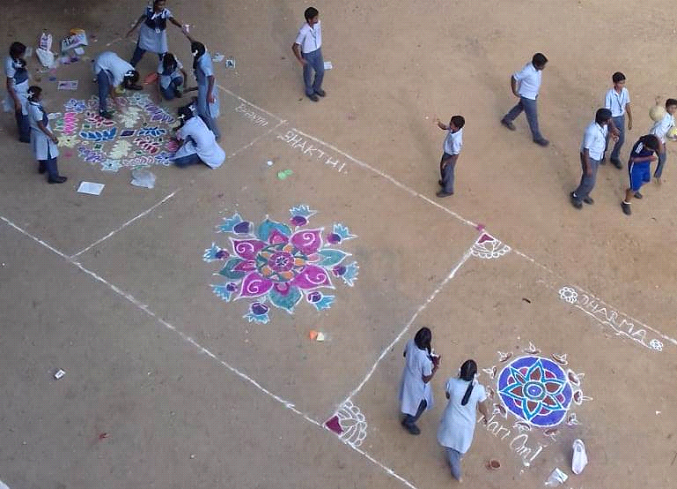 ‘Thai Pongal’ – the predominant festival of the Tamil people across the globe was celebrated with due pomp and gusto. 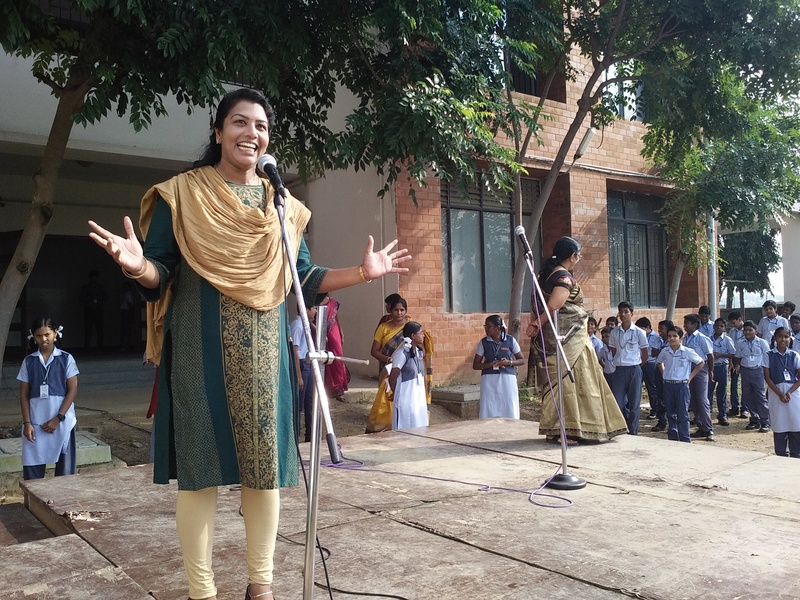 The whole school reverberated with the festive sense. 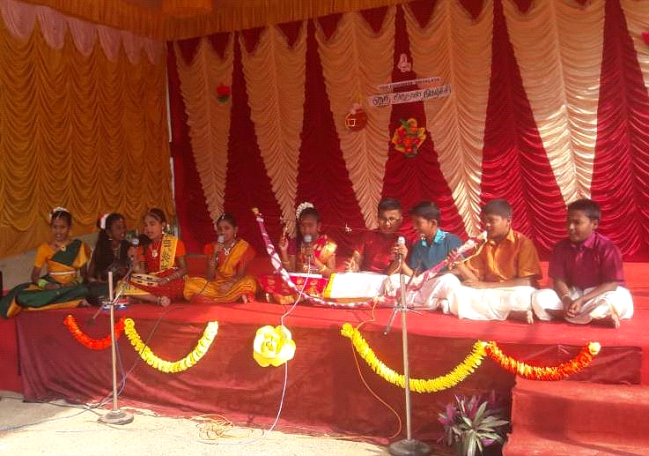 The rustic tunes of ‘Villupatu’ fanned the air of celebration. 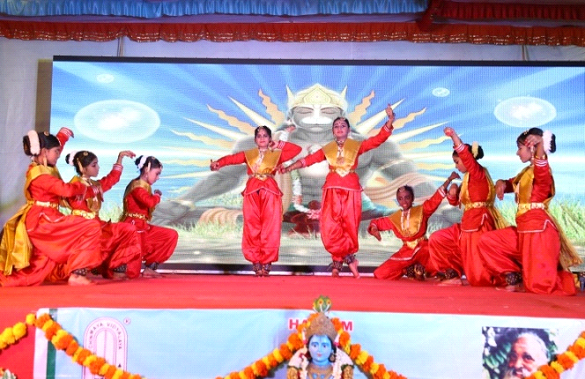 Children of our Vidyalaya expressed their joy and celebration through dance and depictions. 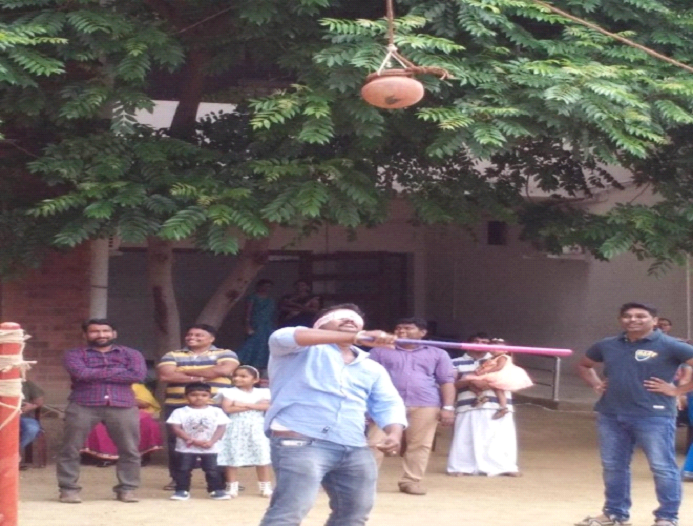 The zenith of celebration was, Sweet Pongal made traditionally at school and distributed to all the staff members. 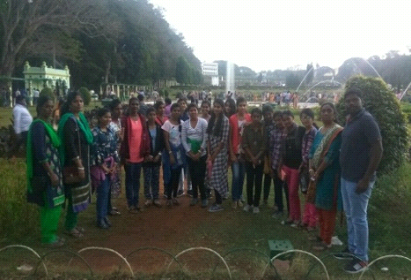 The children of class VIII of our Vidyalaya were taken on an educational tour to Mysore on 11.01.19 & 12.01.19. The trip served to be very informative and entertaining as well. 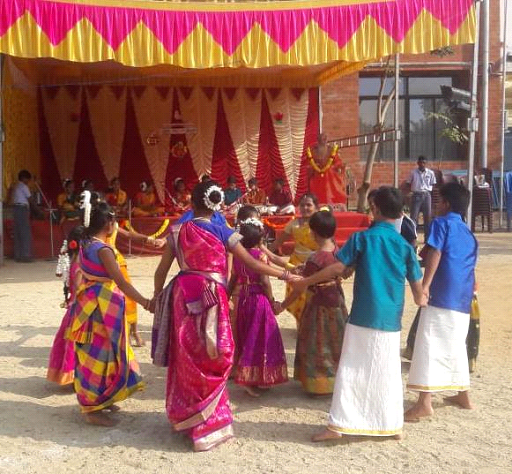 Children enjoyed the fun and the togetherness that prevailed among them. 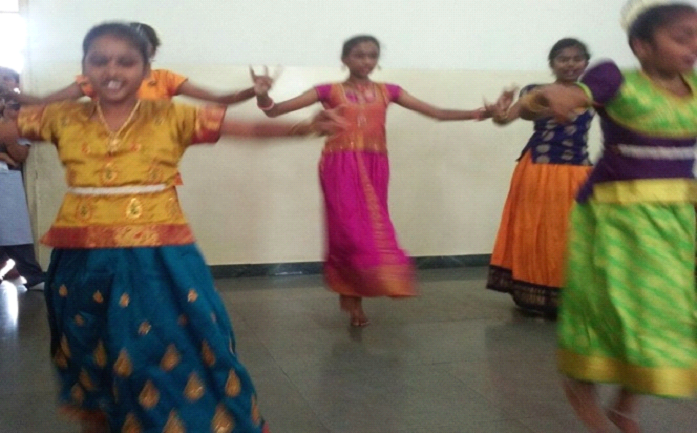 The “Margazhi fervour’ was kept up and observed in our Vidyalaya. 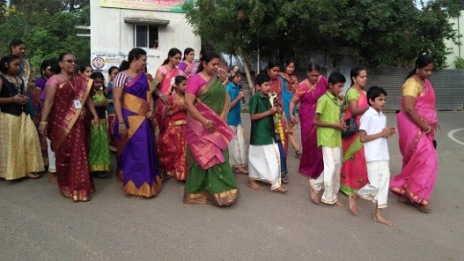 On the second day of this Margazhi month, the Principal, teachers and some of the students took up a procession from a nearby Perumal Temple to our Vidyalaya, rendering Bhajans and Thirupavai. 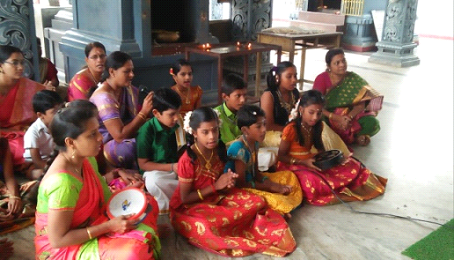 Everyday in our Vidyalaya, Bhajans and Thirupavai are rendered at our Ganapathi Temple. 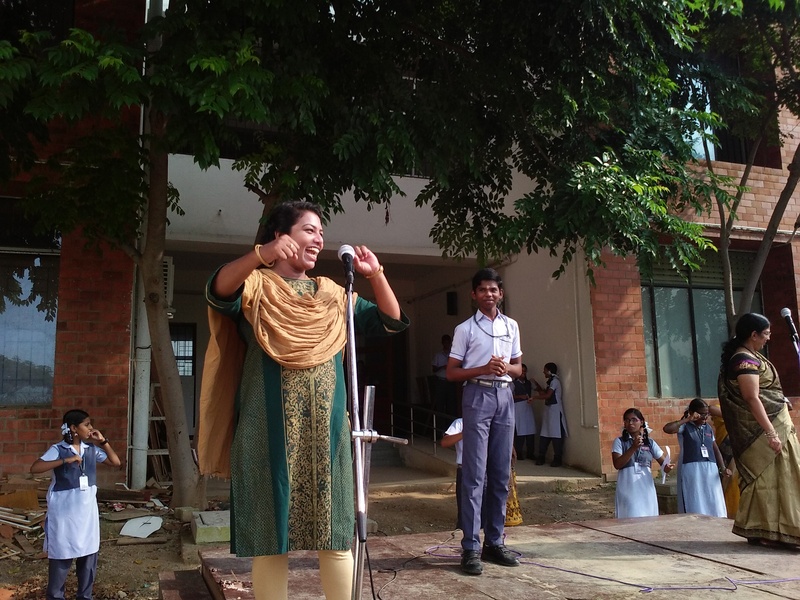 The vahini ‘Kamban Tharum Kaatchi’ hosting the history and some episodes of ‘Ramayanam’ from Kamban’s point of view and the laudability of Tamil Language visited our school for four days from 17.12.18 to 20.12.18. 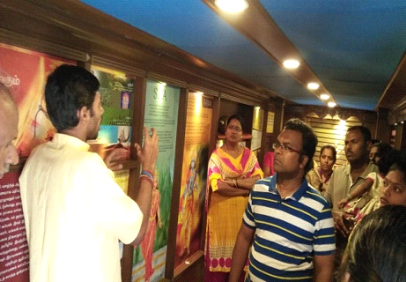 The information harboured within was an eye-opener to many unknown and forgotten facts about our own glorious motherland. 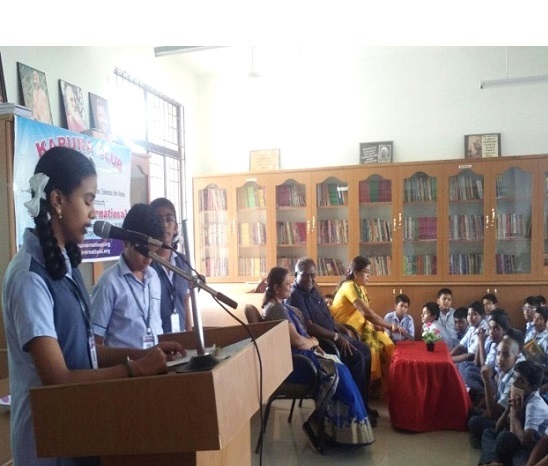 It served deep values and valuable information to the students, teachers and parents. 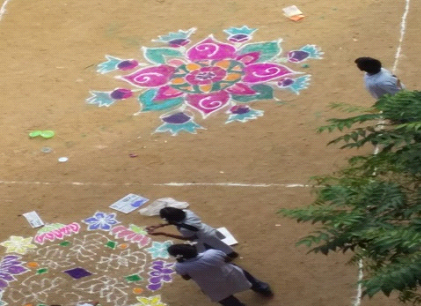 As a part of the CCA competitions, classes VI to VIII had Rangoli Competition on 07.12.18. 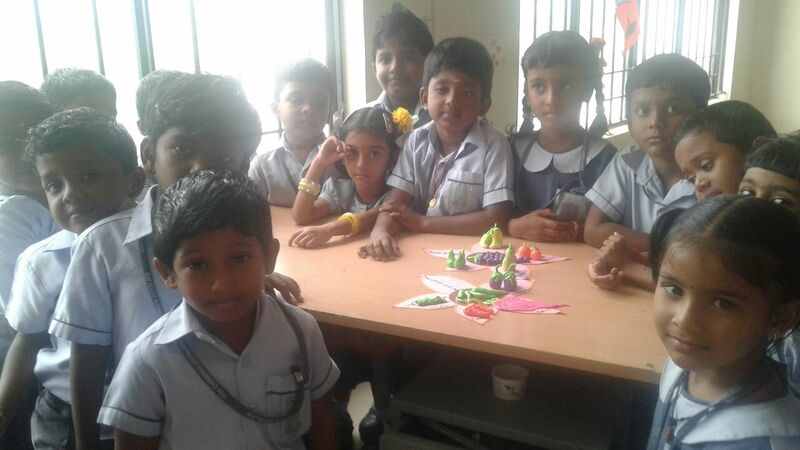 This was an apt opportunity for children to come out with the best of their creativity, artistry and time management skills. 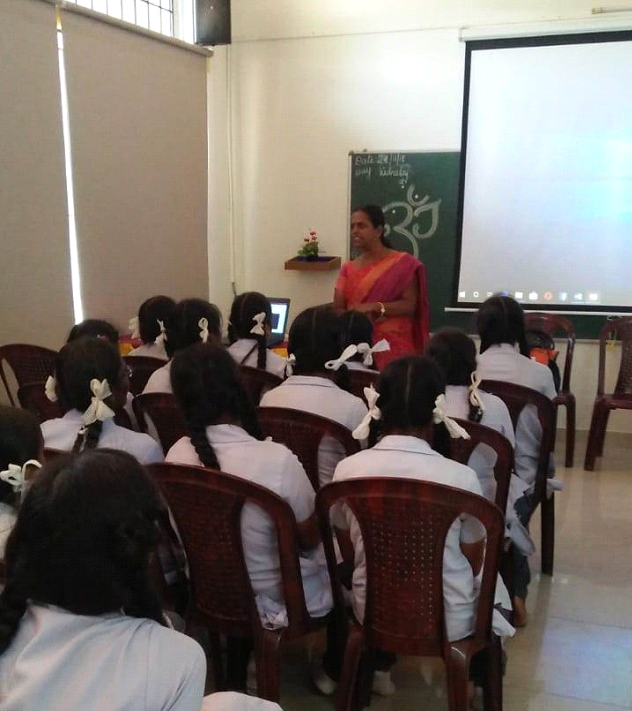 The World soil day was observed in our Vidyalaya by means of an orientation on ‘Rooftop Gardening’ by Smt.Veeralakshmi for class VIII as a part of the Karuna Club initiative. 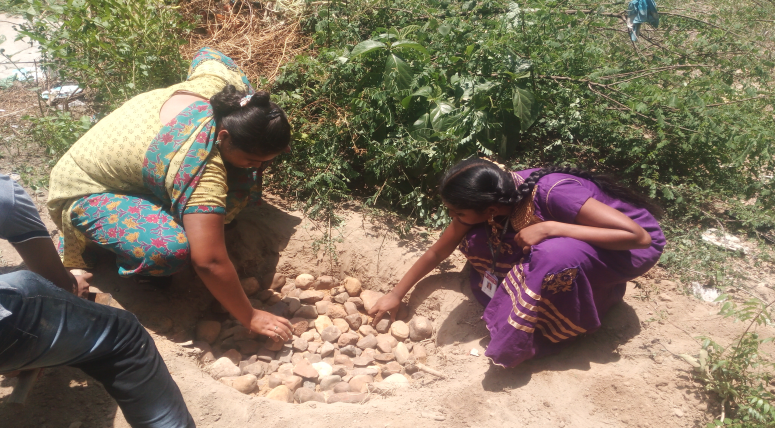 The session gave an insight into the different types of soil and how the soil has to be prepared, manured and maintained for the garden. 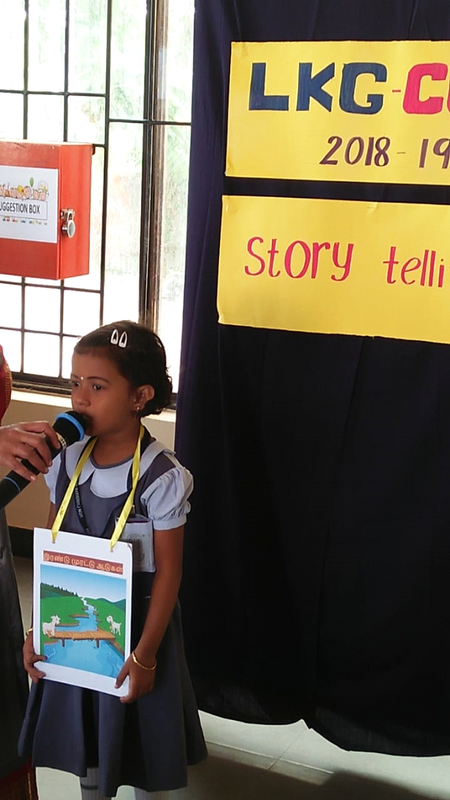 The LKG children were given a challenge of storytelling as a part of the CCA competition. 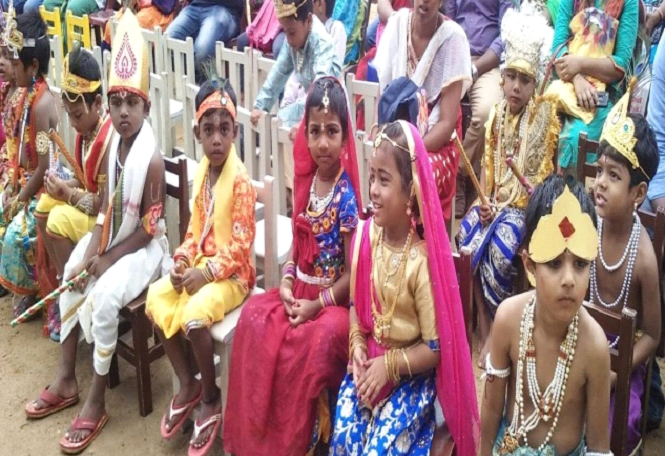 Many children participated with a good spirit. 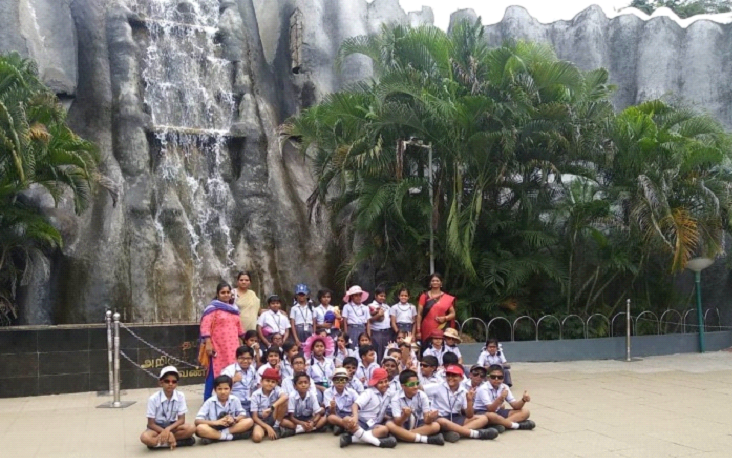 The children of classes IV to VII of our Vidyalaya were taken on field trips (Educational Tour) to various places like Planetarium, Zoological Park (Vandalur Zoo), Museum (Egmore) and Dhakshinachitra respectively. 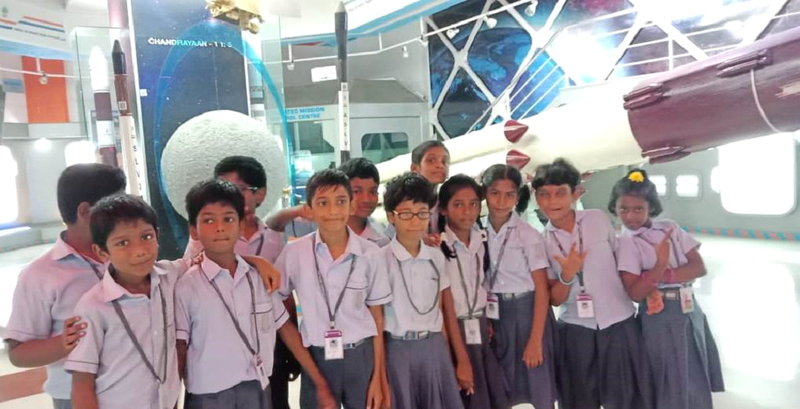 The outcome of such an expedition emphasized the learning experiences, a time of togetherness and fun. 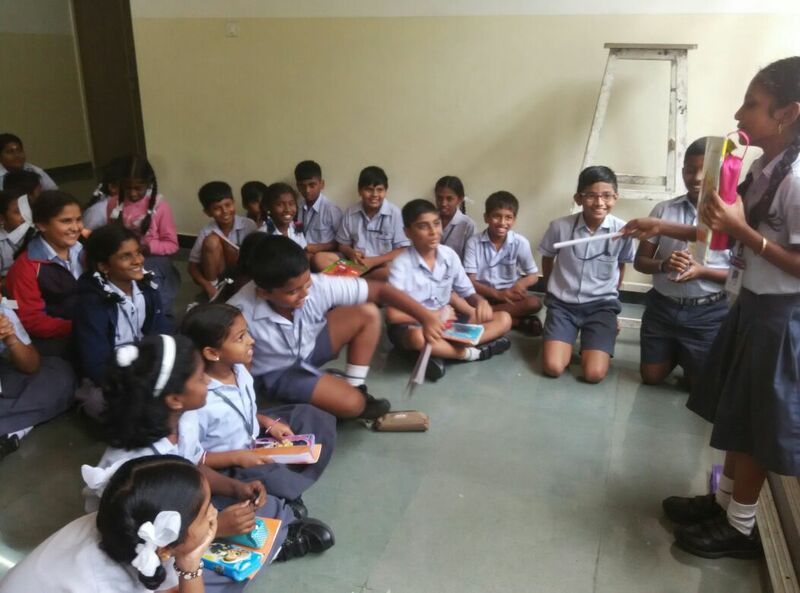 A workshop on ‘Good Touch and Bad Touch’ was conducted on 14.11.18 for classes IV and V in our Vidyalaya. 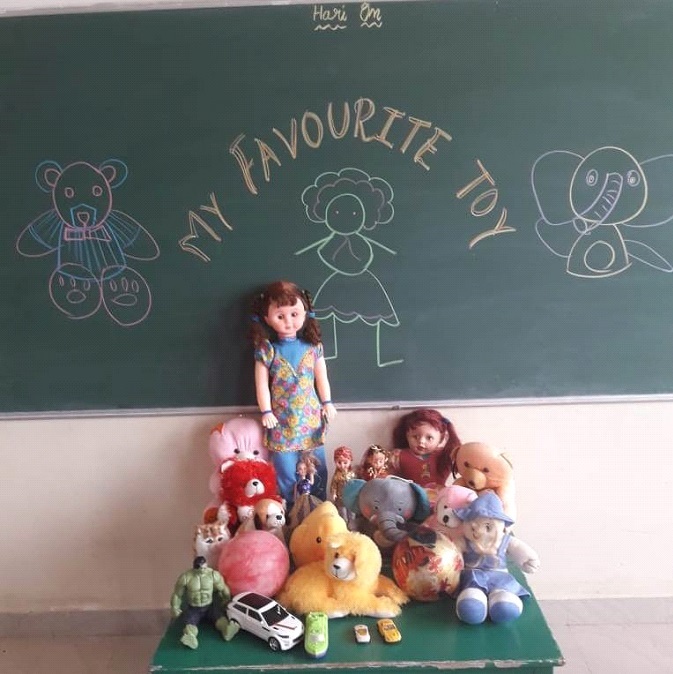 It was a alarm for many children and meted out many measures to beware of the mishaps and how to seek someone’s help if such a situation arises. 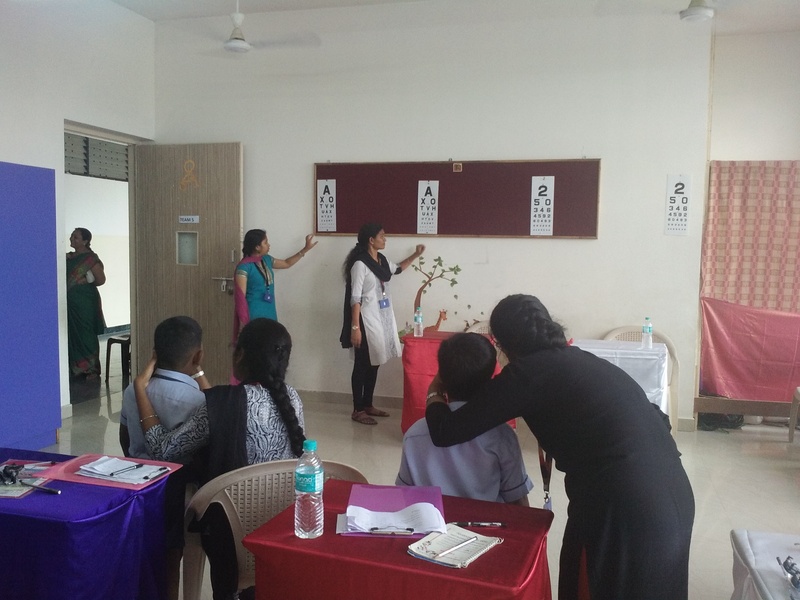 Smt.Swapna, Trainer from ‘Masoom’ - Young Indians and Smt.Soshina, Trainer – ‘Train the Trainers’, Psychological Counselor were the persons who trained the children in the process of the session. 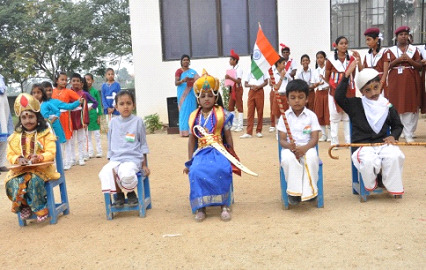 The Children’s day (14.11.18) witnessed a very brief of entertainment at the assembly. 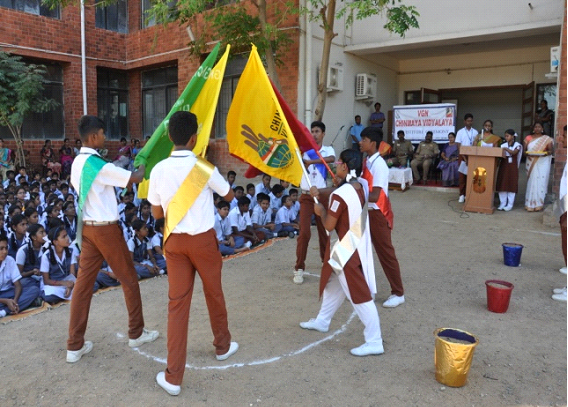 The order of the assembly and the activities were done by the teachers. 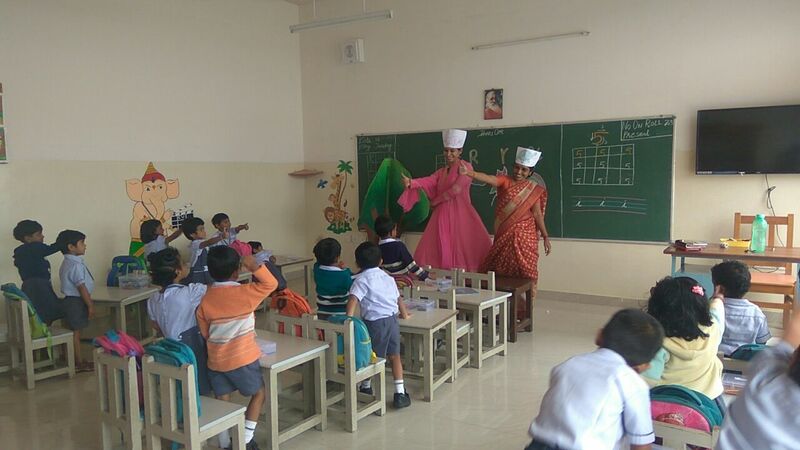 The teachers gave a special song for the children. 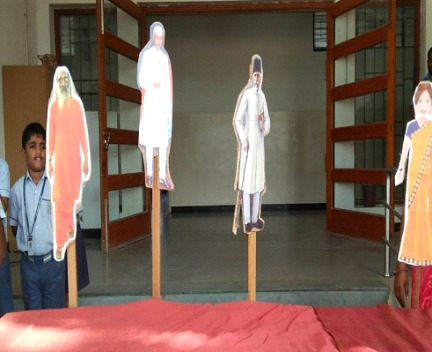 There was a puppet show also. 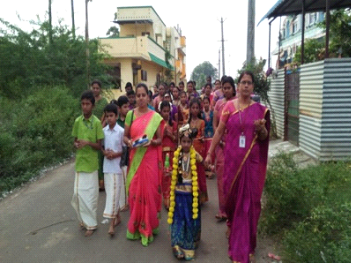 Children were distributed sweets as a mark of celebration. 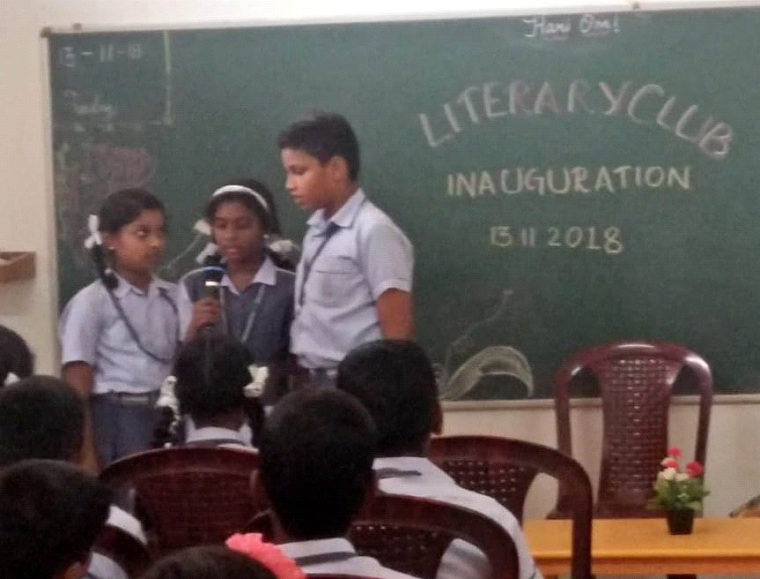 Literary club was inaugurated in our Vidyalaya on 13.11.18. 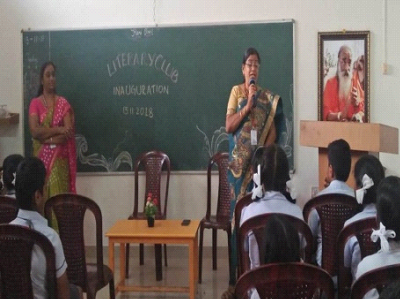 This club focuses on the edification of the children from classes IV to VIII into various literary forms-trilingually. 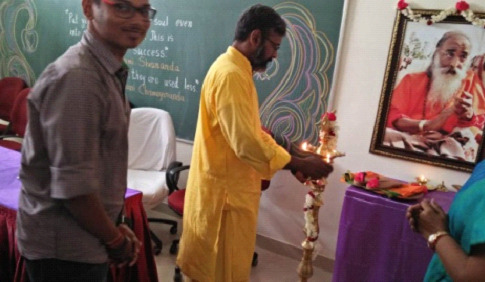 The action plan for the year 2018- 19 was chalked out and declared at the inauguration. 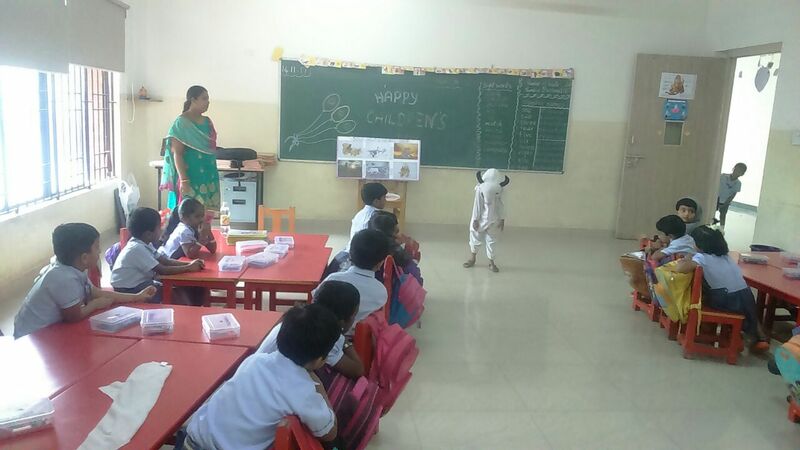 Children came out with enthusiastic participation and interesting plans. 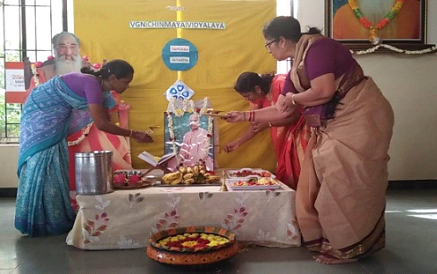 Swami Tapovan Jayanti and Gita Dhinam were celebrated in our Vidyalaya premises on 18.11.2018. 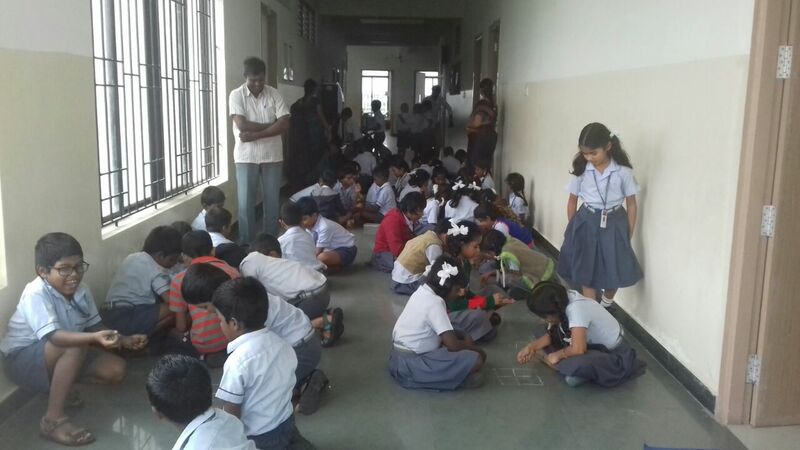 The brisk participation of the children and the parents made the day complete. 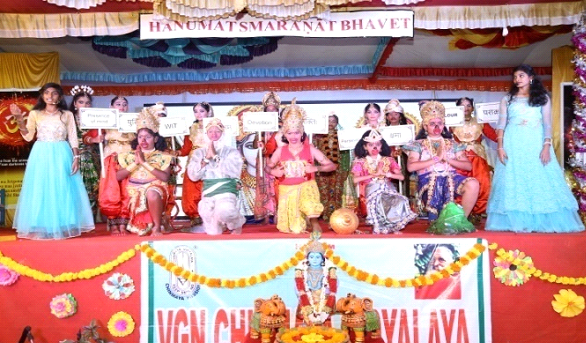 The celebration included Gita Chanting, Tapovan Astakam and Astothra Namavali of Tapovan Maharaj. 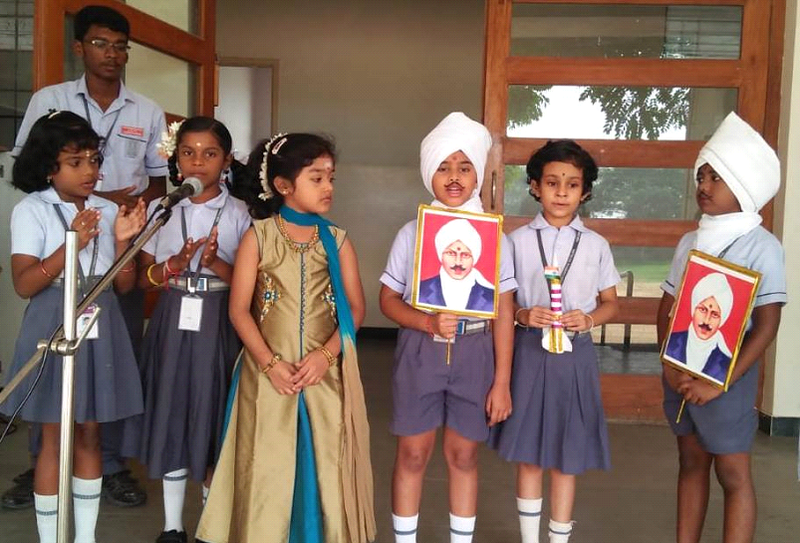 Morning Assembly is made interesting and informative by including activities like speech, poem recitation, storytelling and puppet shows. 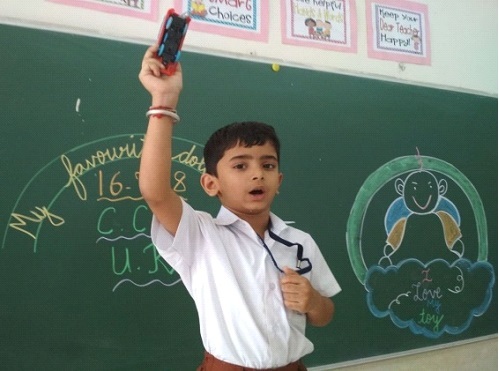 One such activity is the story told by a tiny tot of Std I B – Vignesh. The story had a moral in store. 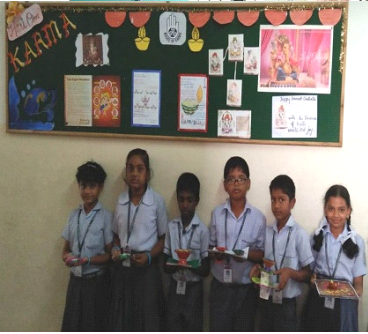 The celebration of Diwali – the festival of lights took place in our Vidyalaya on 02.11.18. 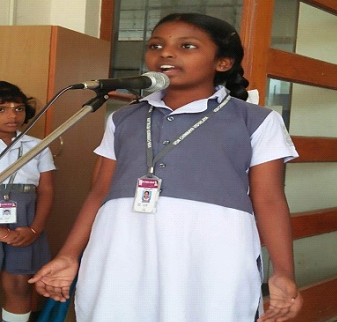 Students of Std V came out with their contribution in the form of Songs, poem recitation, speech and chart works. 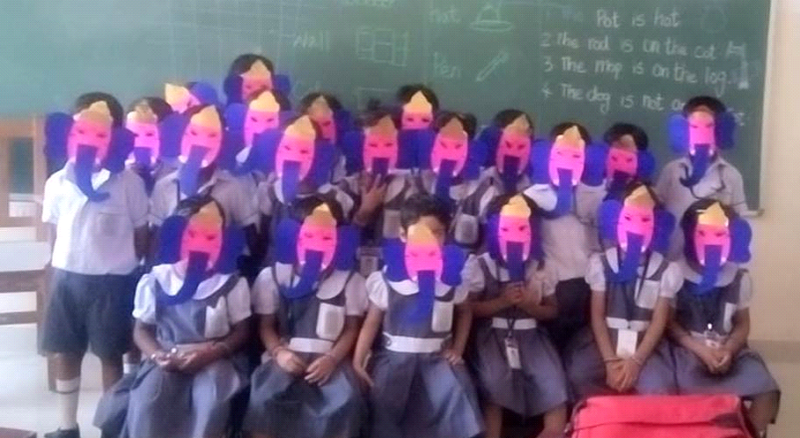 It created a festive sense in everyone. 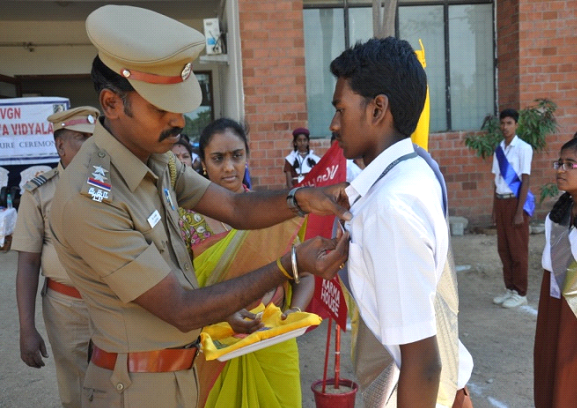 The Principal advised the students to celebrate Diwali in a safe and secure manner, enumerating the safety measures. 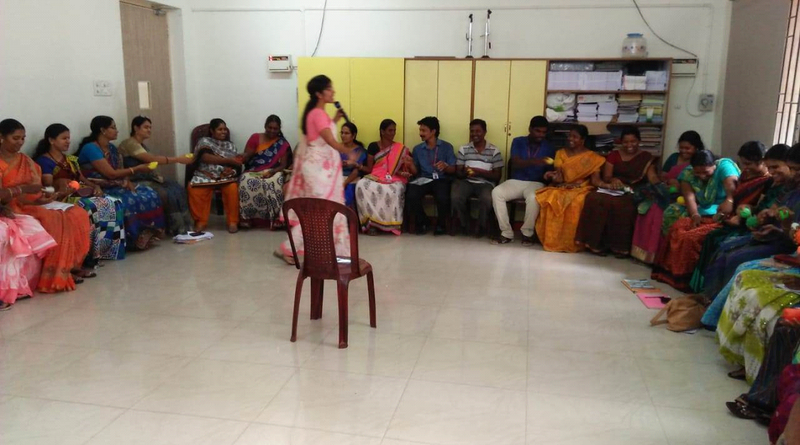 A counselling session for the teachers of our Vidyalaya was conducted by our Vidyalaya’s counselor, Ms.Uthara on 19.09.18. 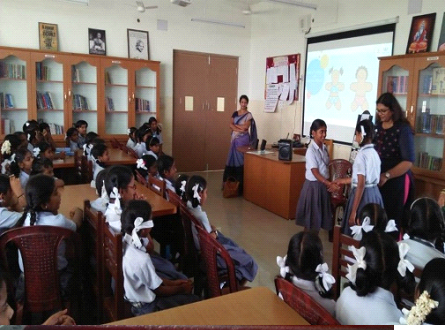 The session comprised of activities on sharing, talking and listening, queries from the side of teachers and the counselor’s solution to the problems. 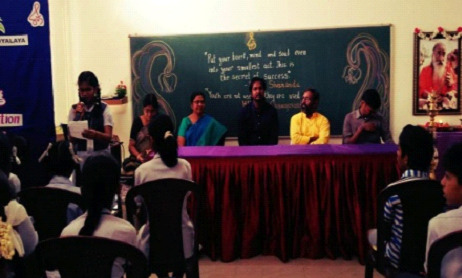 It was a very lively and interactive session, benefitting every participant. 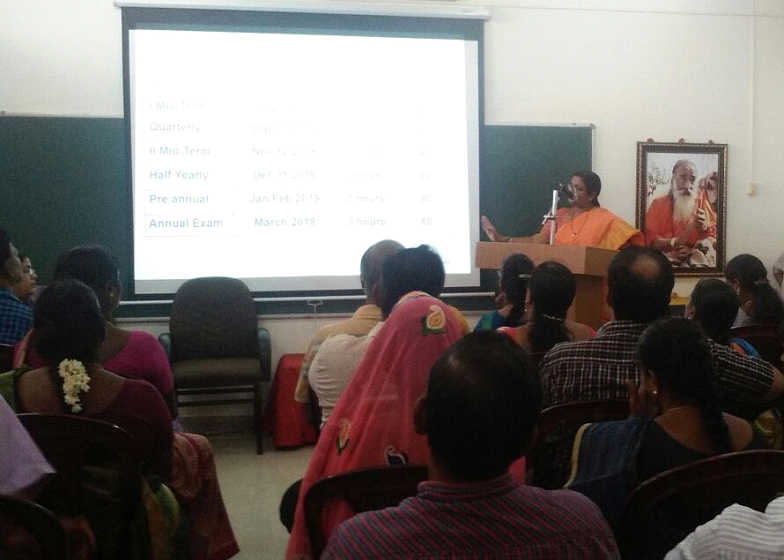 The Vidyalaya organized a special talk by Br.Anand Chaitanya to our parents on 12th September, 2018, to motivate and gear up them to participate and get benefited by the Yagna, ‘Tame the Mind’ from 27 to 30th September, 2018 by SwamI Swaroopanandaji. 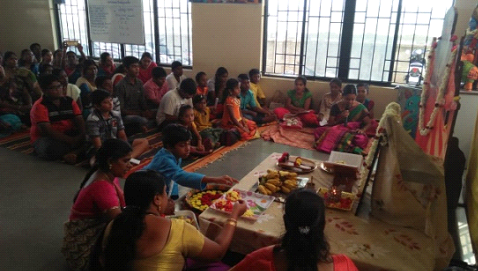 The session was a good motivation to the parents. 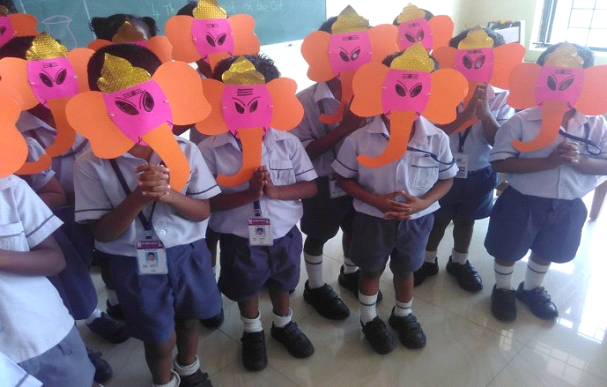 In accordance with the Ganesh Chaturthi celebration in the school, the KG children were given an interesting take away – a beautiful and colourful mask of Ganesha to wear home. 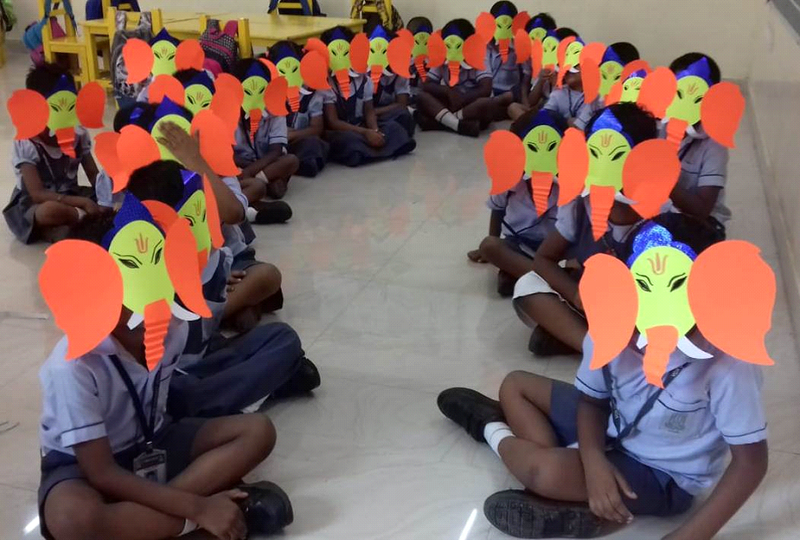 This is a simple and artistic way to introduce and make the children fall in line with the Indian Culture. 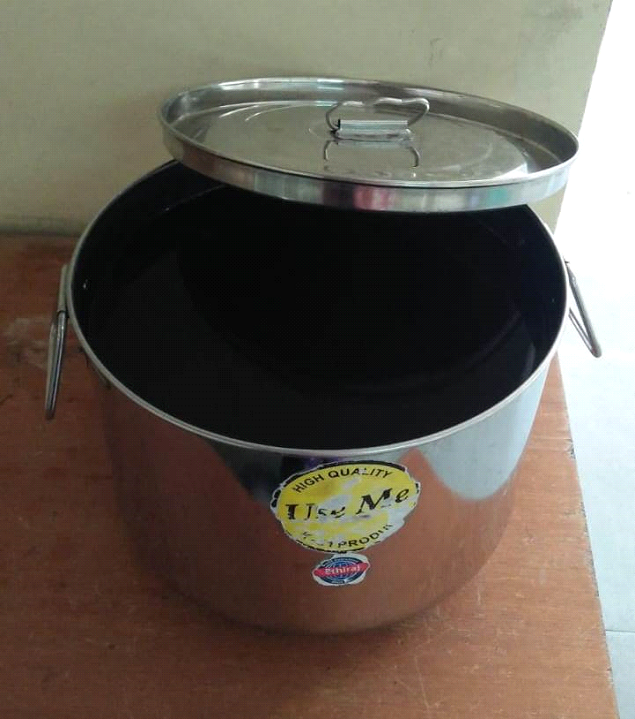 Nilavembu Kudineer is a herbal drug comprising nine ingredients in equal measure. 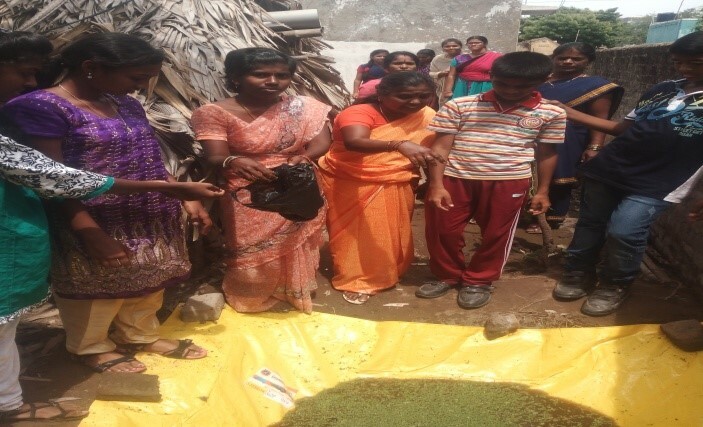 The primary ingredient of the drug -- Nilavembu (Andrographis Paniculata)--is a small plant that is said to have antipyretic, anti-inflammatory and anti-analgesic properties and several other health benefits. 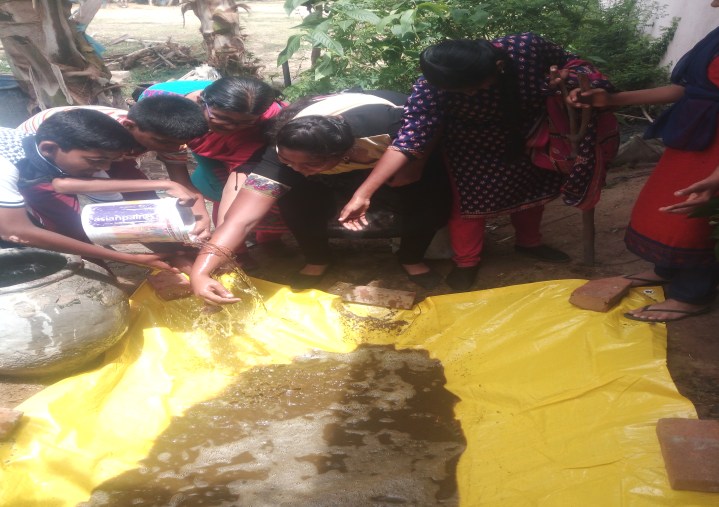 The Vidyalaya, with the support of the Municipality has taken this step to administer the Kasayam on four consecutive days in a week in the right measure. 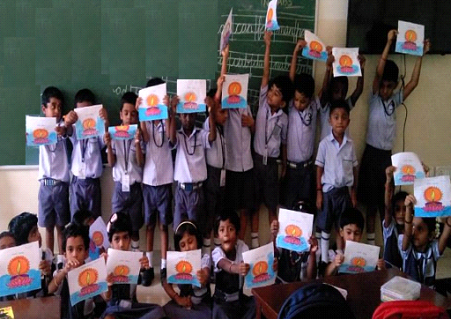 This is a venture towards boosting the immunity of the children against Dengue, Malaria and other proned diseases. This is in allegiance with the CVP – the Physical Development. 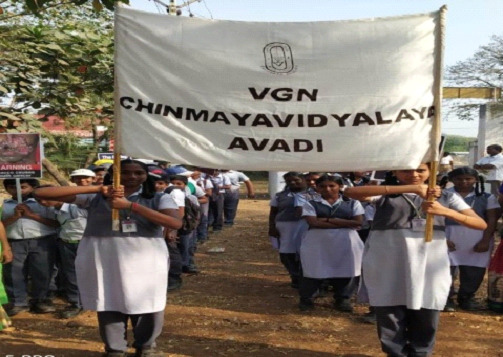 VGN Chinmaya Vidyalaya, Avadi celebrated its 8th Annual Day on 8th September, 2018. The Hony. 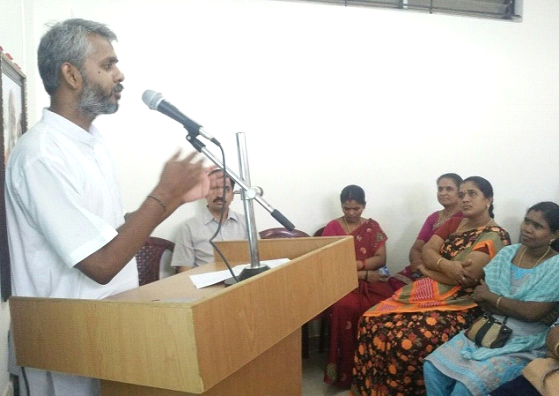 Correspondent Sri.Rajkumar Devarajan welcomed the gathering. 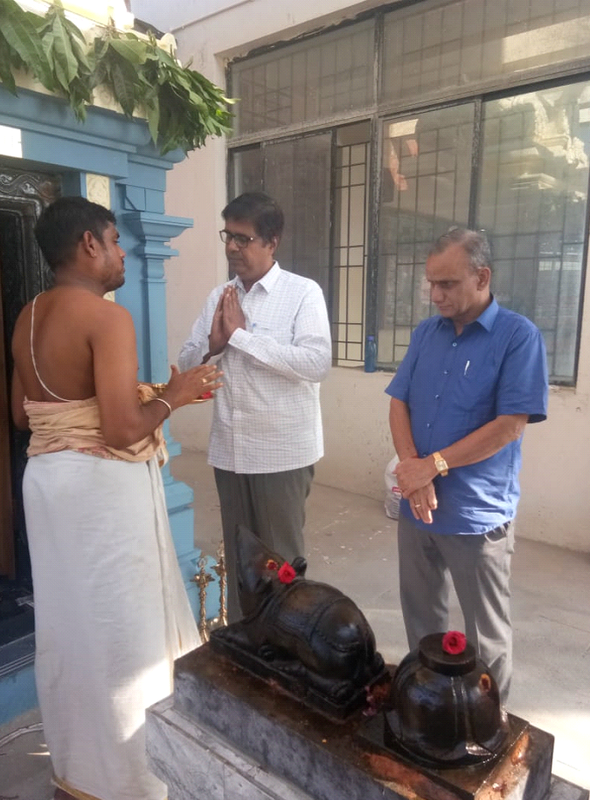 Sri.V.N.Devadoss, Chairman, VGN Properties Pvt. 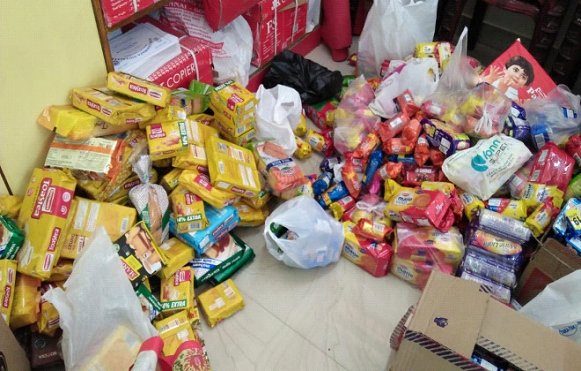 Ltd., was the guest of the day and distributed the prizes. 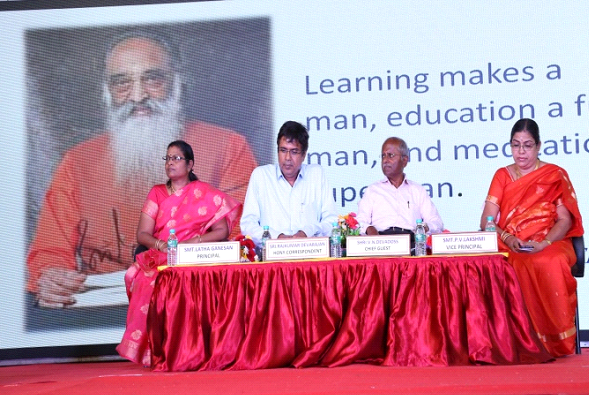 The event was further graced by the presence of Smt.Jayanthi Amma, President, Chinmaya Mission, Chennai. 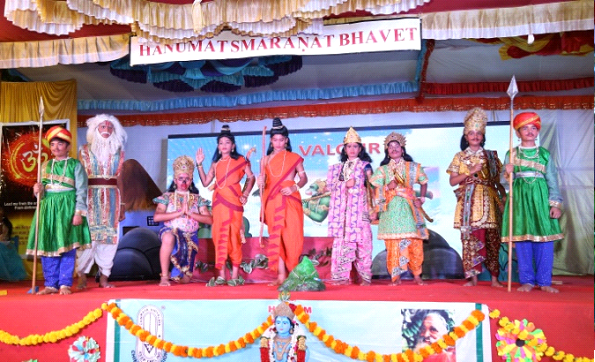 The highlight of the day was the thematic cultural show: “Hanumath Smaranat Bhavet” – depicting the various facets of Hanuman. 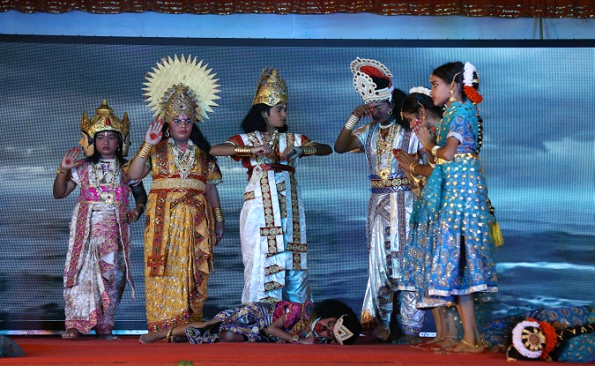 The show brought out the values of PERSEVERANCE, PRESENCE OF MIND, VALOUR, WIT and DEVOTION that children could imbibe from Lord Hanuman. 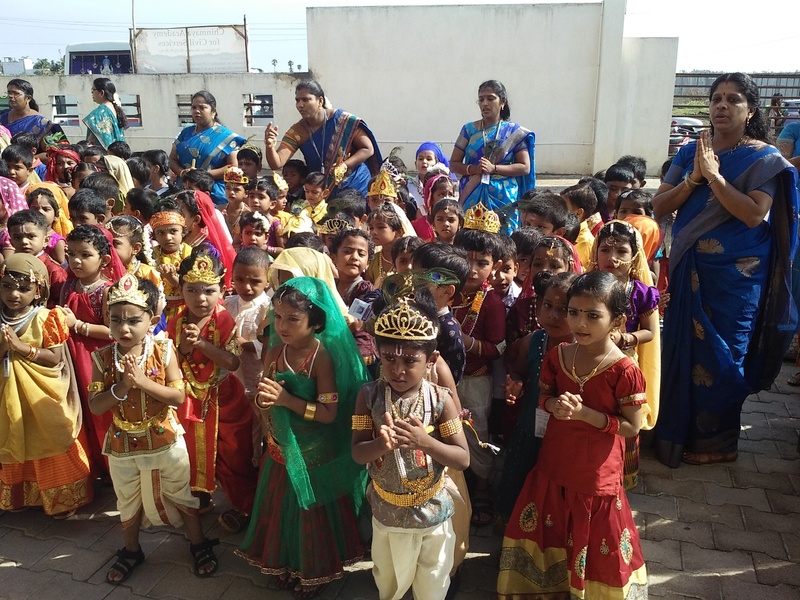 Krishna Jayanthi, the very auspicious day was celebrated in our Vidyalaya on 2nd September, 2018. 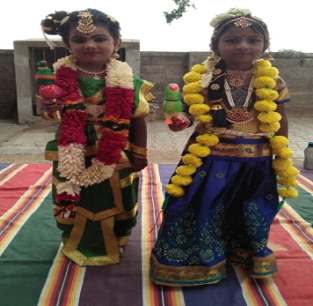 The KG children brought out the fervour of the day by being disguised as ‘Little Krishna and Radha’. 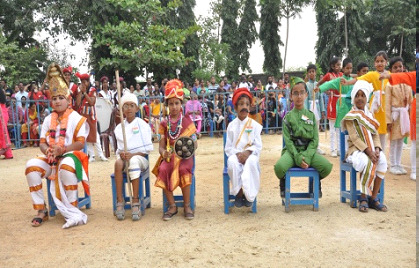 The highlight was, the parents of the KG children were invited for an entertainment show, ‘Uri adi’. The flavour lingered throughout the day. 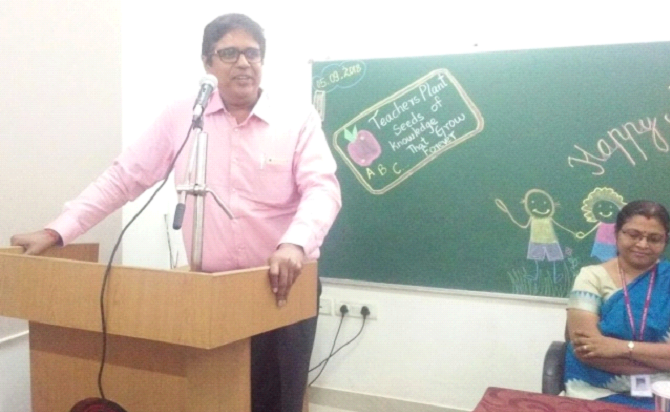 The teachers’ day was celebrated on 5th September, 2018. 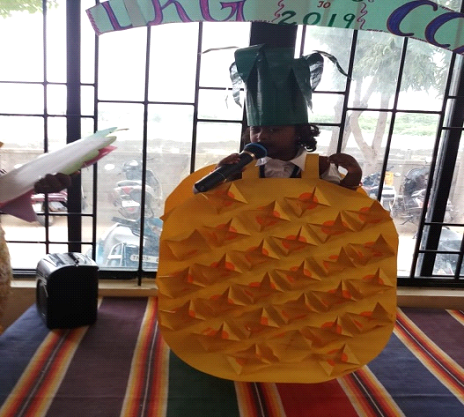 The students organized a programme to honour and entertain teachers such as: poems and songs dedicated to teachers and a dance to entertain. 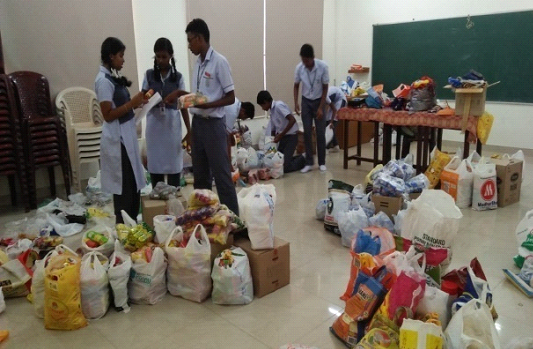 Our Vidyalaya parents extended their whole hearted support to the Kerala flood relief effort of the Chinmaya Mission by contributing 450 bags of rice, 62 kg of pulses, 2000 packets of biscuits and several bags of toothpaste along with brushes, soaps, cleaning materials etc. 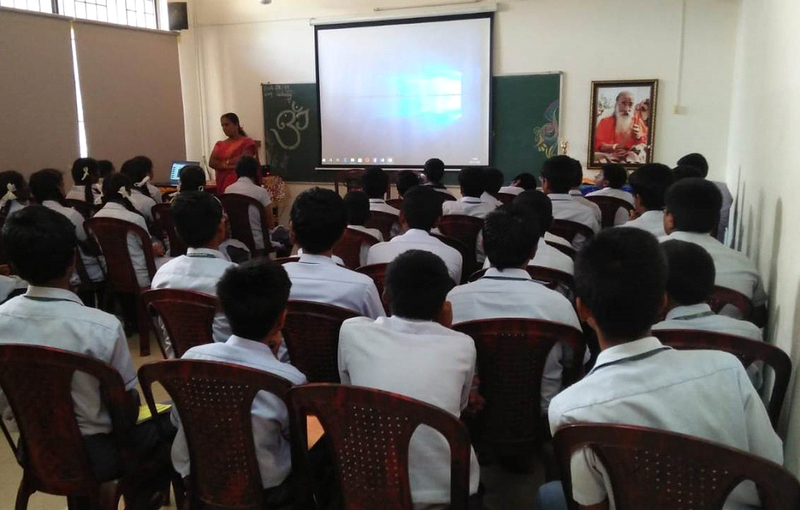 We thank the parents and the Chinmaya Mission for the initiative. 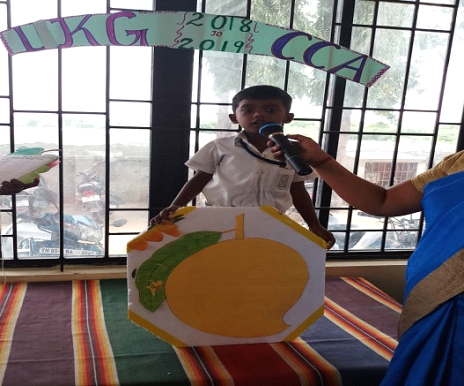 As a part of the CCA, the LKG children observed fruits day on 27th August 2018. 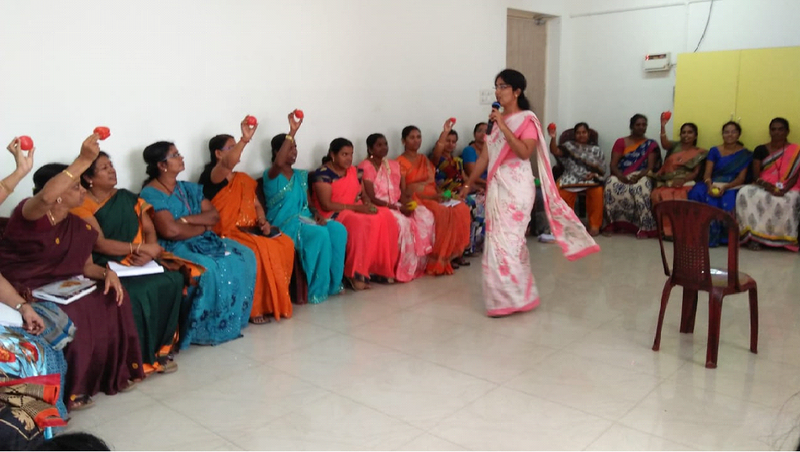 This was an innovative methodology adopted to bring out the importance of eating fruits as well as the nutrition present in it. 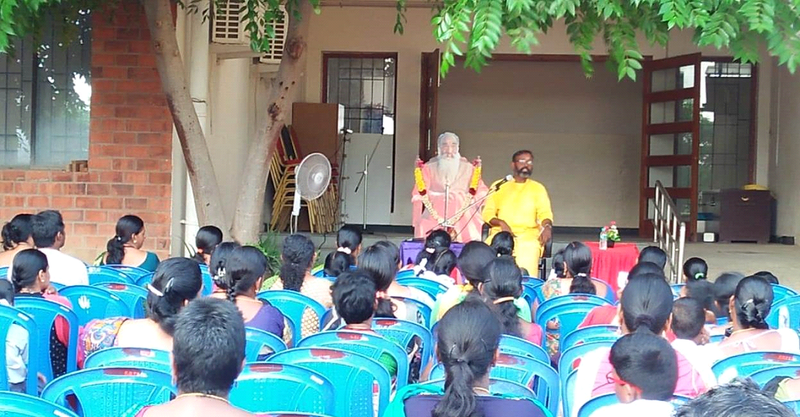 'The art of graceful ageing’ a one day orientation programme was conducted at Chinmaya Sarveswara Dhyana Nilayam, Thamaraipakkam for the grandparents of our Vidyalaya on 19.08.18.The event was anchored by Swami Sureshanandaji. 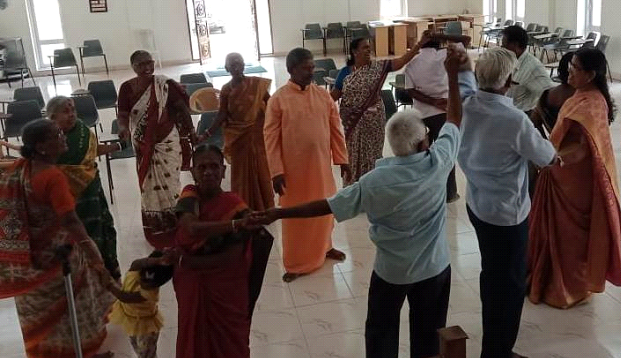 Yoga activities and games were conducted for the grandparents. 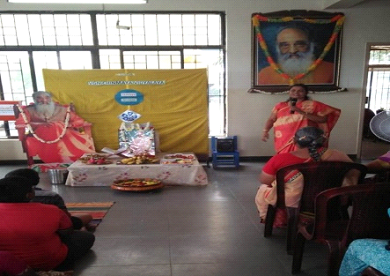 Swami Sureshanandaji emphasised on the role of elders in the family. 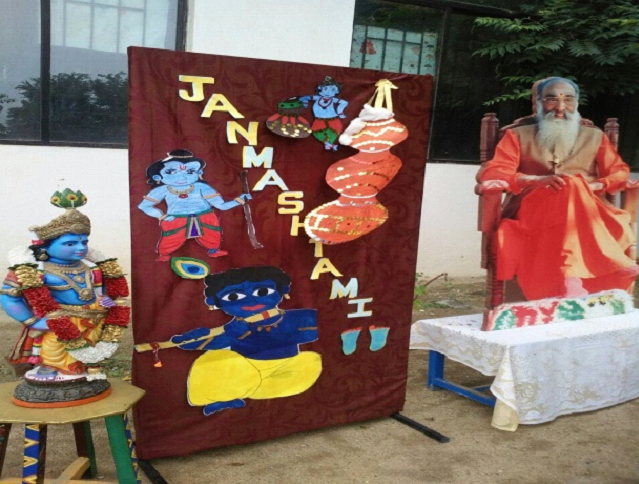 He further gave an introduction on Upanishads. 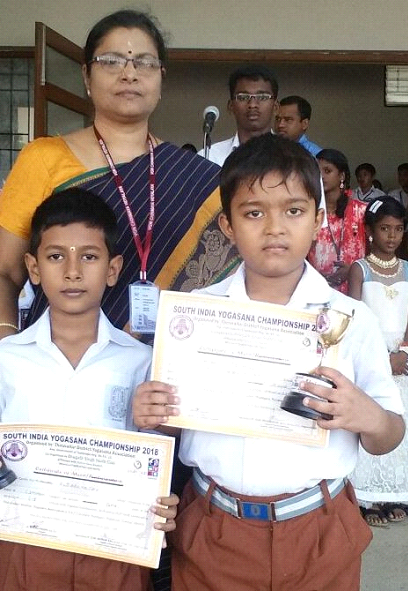 Two of our students, S.Jai Adhish and A.Dhananjay participated in the South India Yogasana Championship 2018 conducted at the Thiruvallur District Yogasana Association and were placed second and fifth respectively. 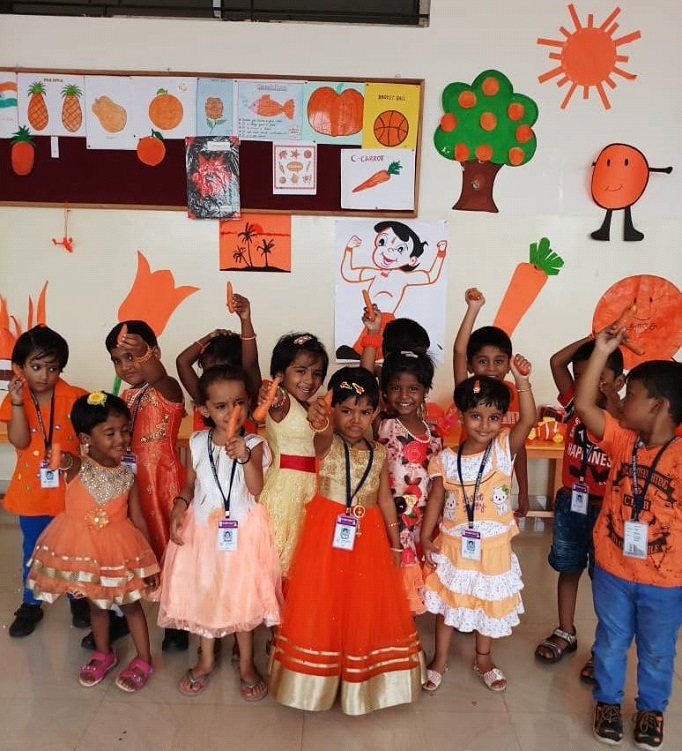 The tiny tots of LKG stole the show on 20.07.18, being clad in different colours as they celebrated ‘Colours Day’. 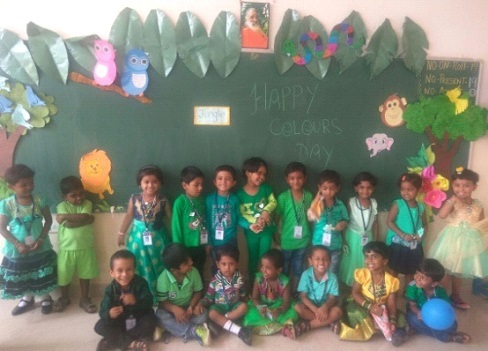 This was a perfect motivation for the children to learn and identify the different colours of nature. 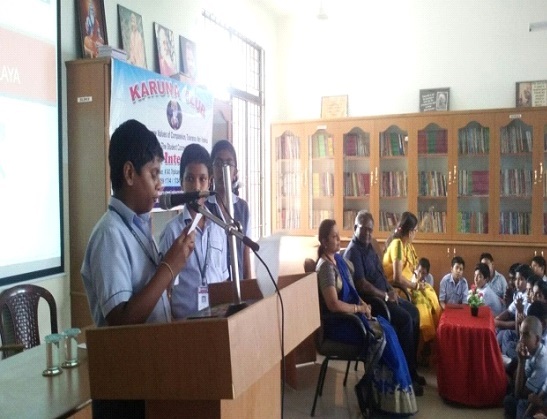 The Karuna Club which is one of the very important extra-curricular activities of the Vidyalaya was inaugurated for the year 2018-19 on 19.07.18. 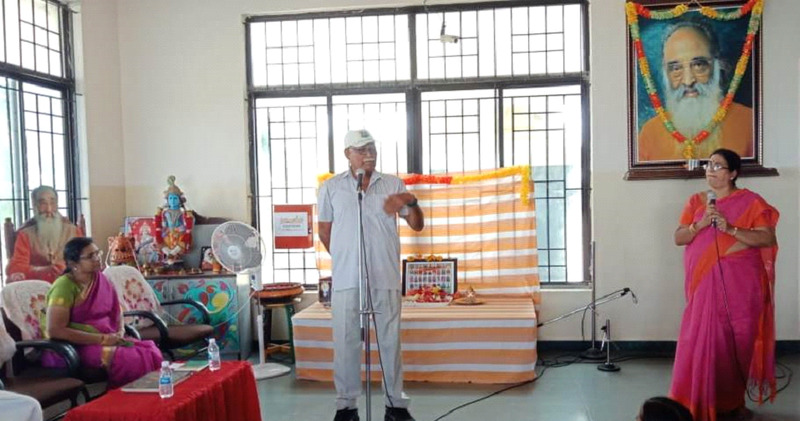 Sri.Ramamurugesan, Educational Officer, Karuna International was the Guest of Honor, inspiring many with his thought-provoking speech, emphasizing Karuna values. 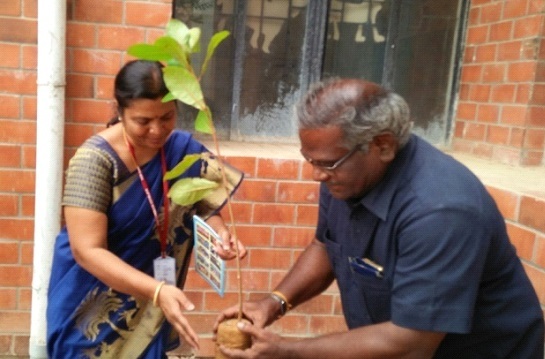 To commemorate the occasion, Sri.Ramamurugesan, planted a sapling. 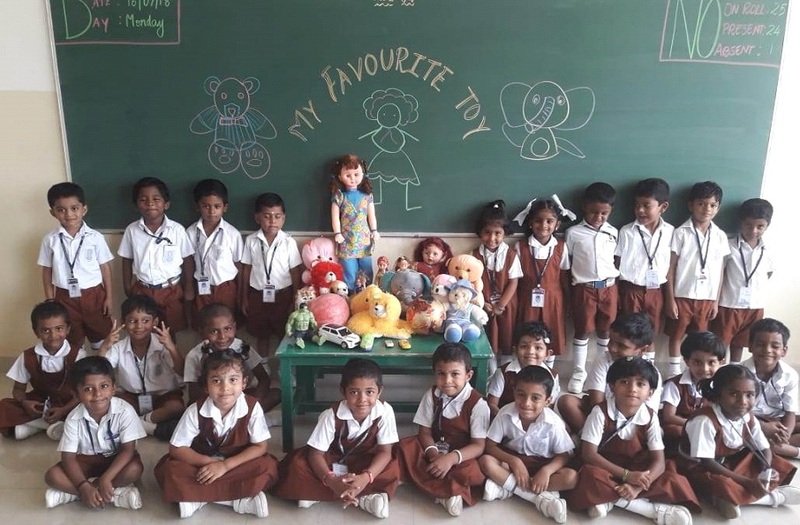 The competitors were to speak on ‘My Favourite doll or toy’ for one minute on 16.07.18. 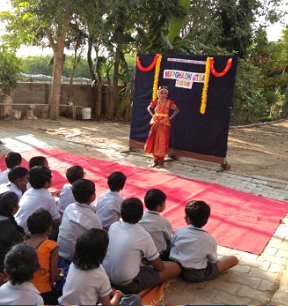 The parents were invited to witness the show. 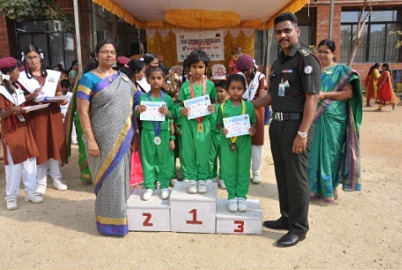 This paves way for a healthy competition among the children. 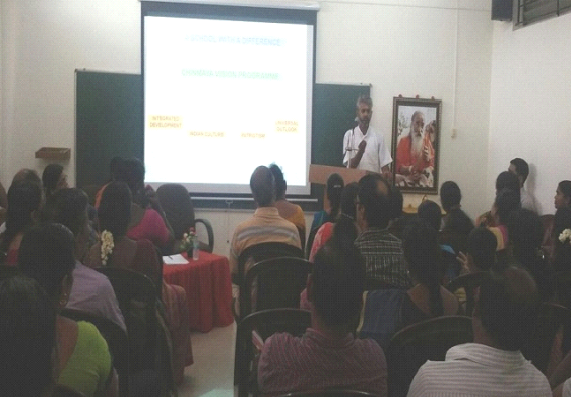 An exclusive session for the parents of classes was organised by the Vidyalaya. 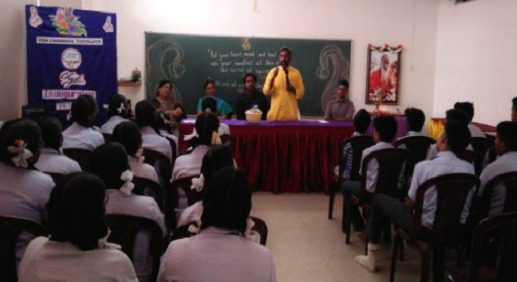 Arunachalamji, the resident Sevak at Thamaraipakkam Ashram addressed the parents. 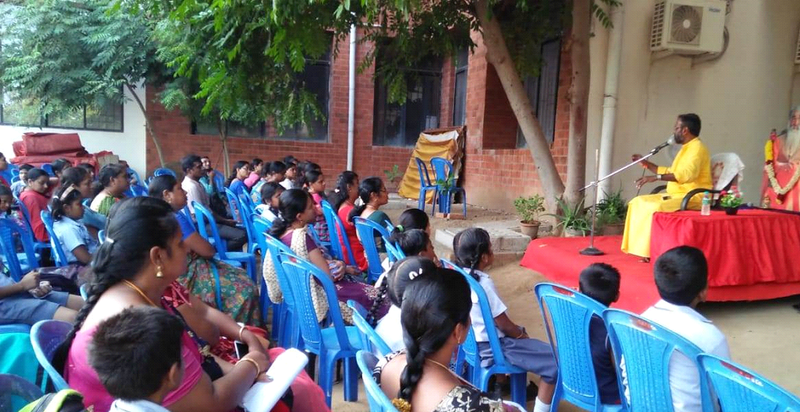 The orientation was on CVP values and ‘Effective Parenting’. 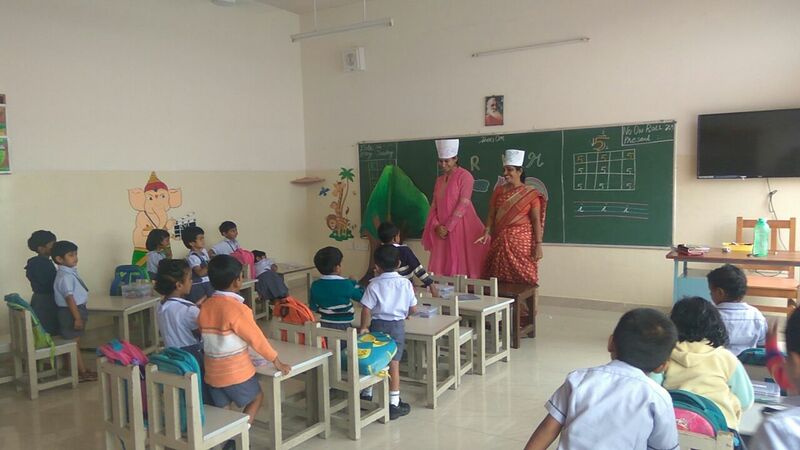 parents and the school play an equal role in shaping the children. 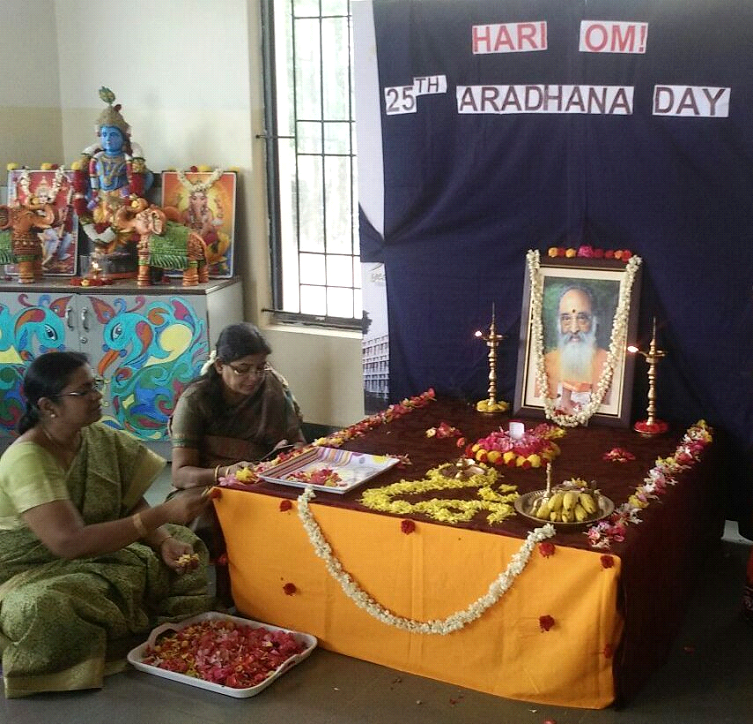 In commemoration of the 25th Aradhana Day (03.08.18) of our beloved Gurudev, our Vidyalaya observes 25 days of Padhuka Pooja to the great Master – a class a day, starting from 10.07.18. 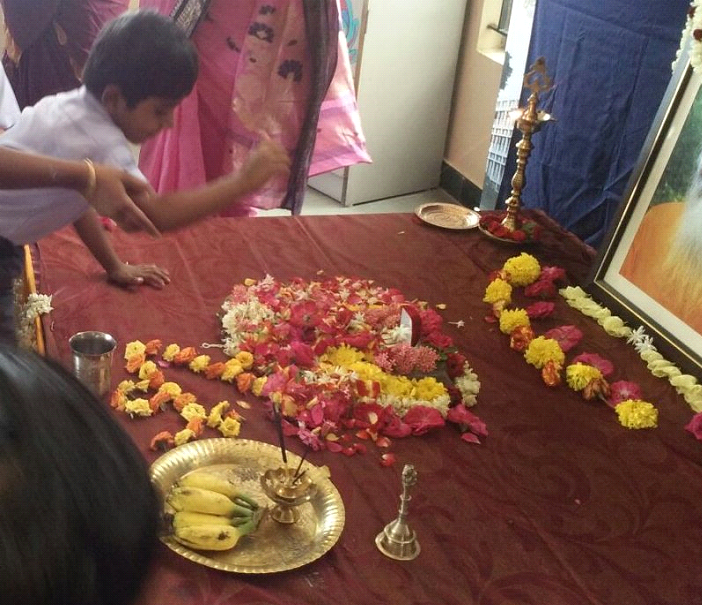 It is scintillating to see the tiny tots perform Pooja and pay their tribute to the numinous saint. 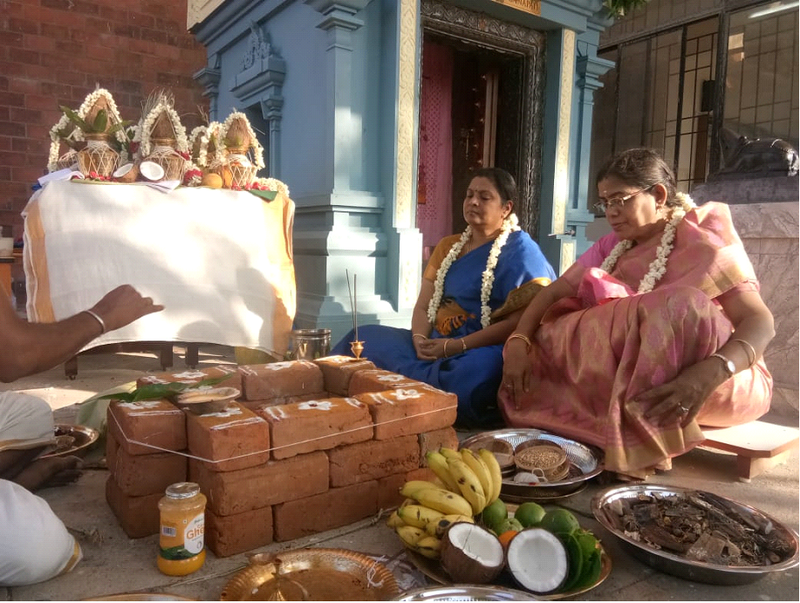 The Pooja includes Ashtothra Namavali and Chinmaya Aarti. A birthday wish is sent your way hoping you'll have a wonderful day. Surrounded by people you hold most dear, gathered to celebrate one more year. A happy day is wished for you, We hope it lasts the whole year through!. 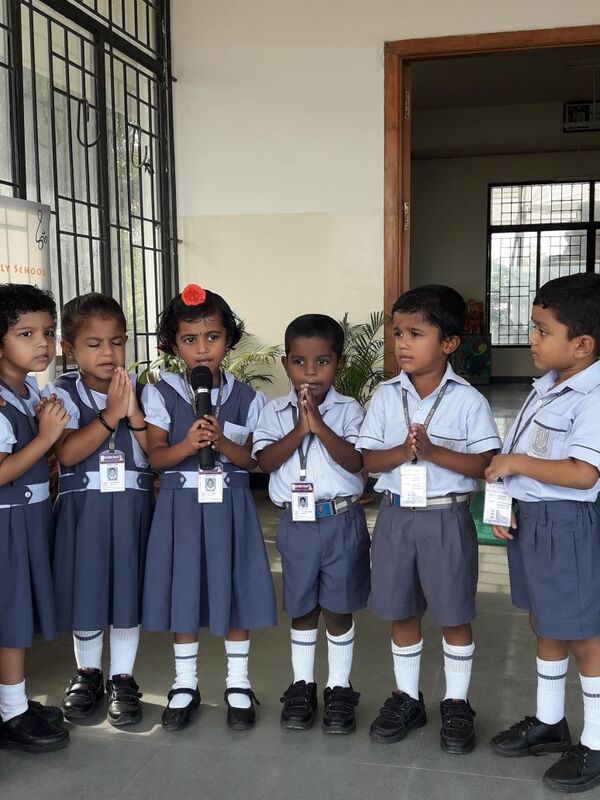 The birthday of Guruji (30.06.18) was celebrated in our school by chanting Bhajans and Mryutunjai Mantra for 21 times towards good health and well being of Guruji. 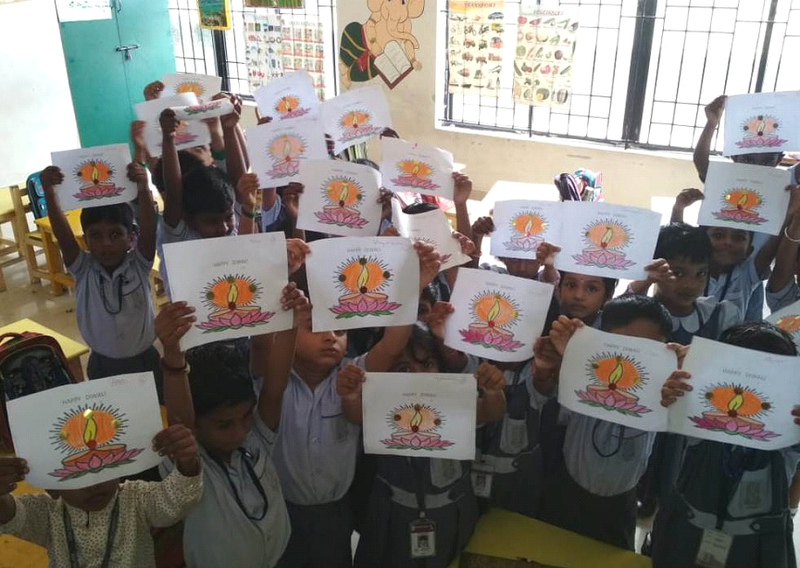 The students extended their wishes by making greeting cards for Guruji. 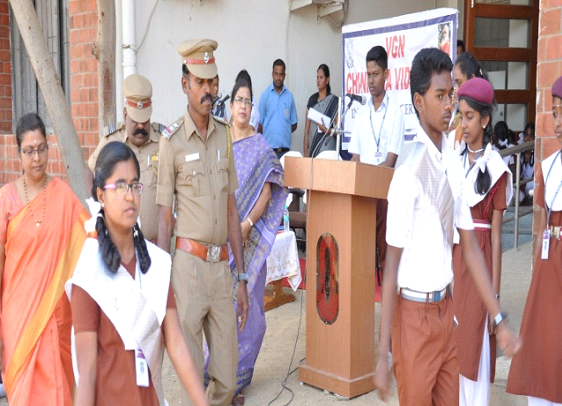 The swearing in of the Students’ Council of VGN Chinmaya Vidyalaya of 2018-19 was ceremoniously conducted on 23.06.18. 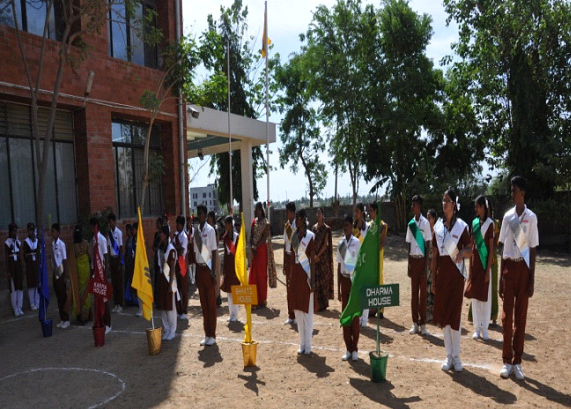 The children of the Vidyalaya are compartmented into four houses namely Gyan, Karma, Bakthi and Dharma. 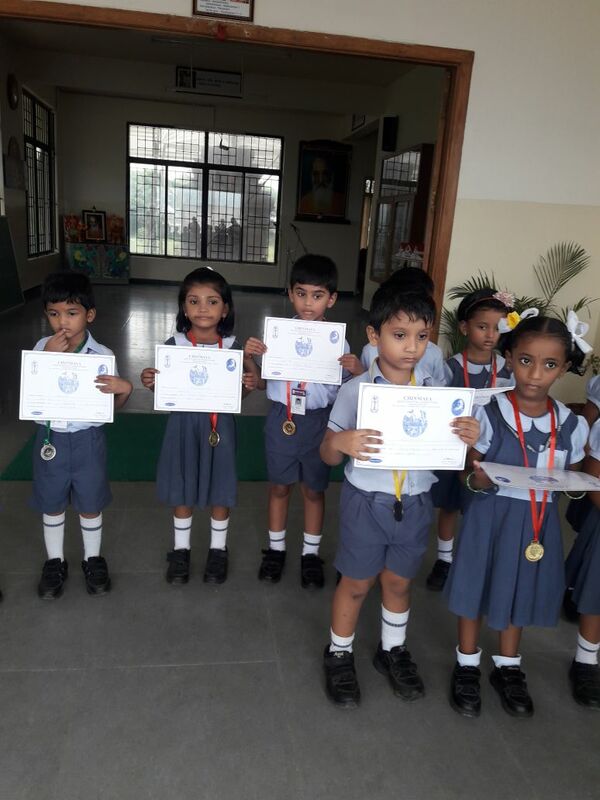 The office bearers, the House Captains and the Vice-Captains were invested with Rank and Honors. 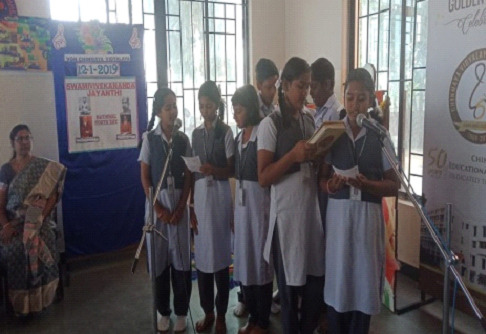 The Students’ Council took an Oath to shoulder responsibilities and duties with the true spirit of loyalty and integrity. “Adventure is an attitude that we must apply to the day to day obstacles in life.”. 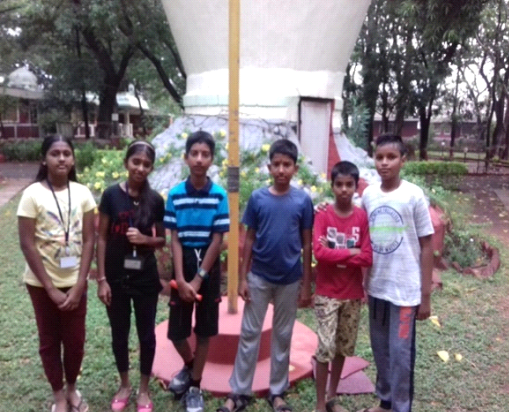 The Shubh-Sahas Camp was conducted for classes IV, V and VI at the Chinmaya Gardens, Coimbatore. 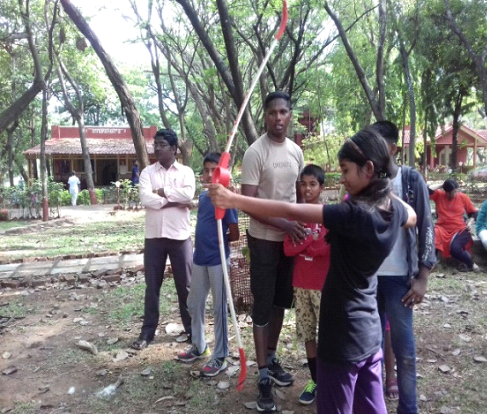 It was a splendid venture making the children fit to encounter both mental and physical challenges. 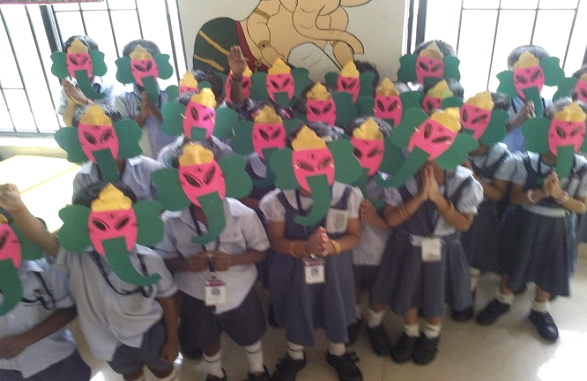 It boosted the confidence level of the children, driving out the cloud of fear. 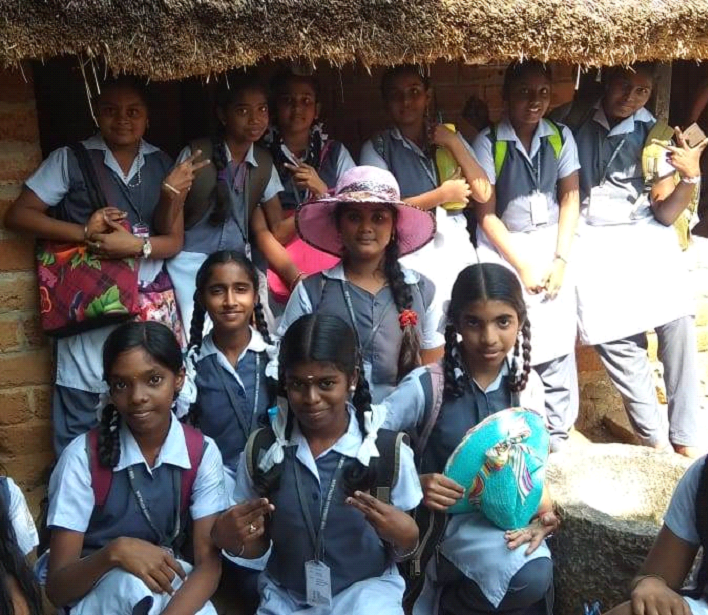 “Service to others is the rent you pay for your room here on earth”..
Nine students attended the Hari Seva camp at the Chinmaya Gardens, Coimbatore. 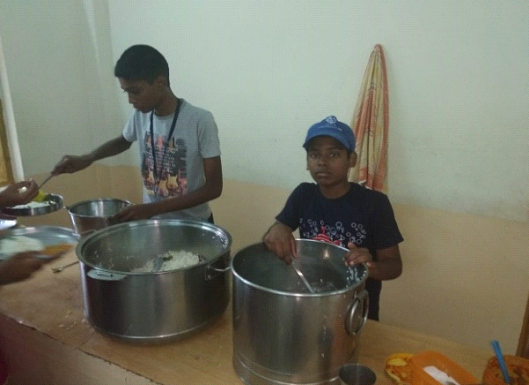 The camp aimed at brotherhood, equality and fraternity among children. 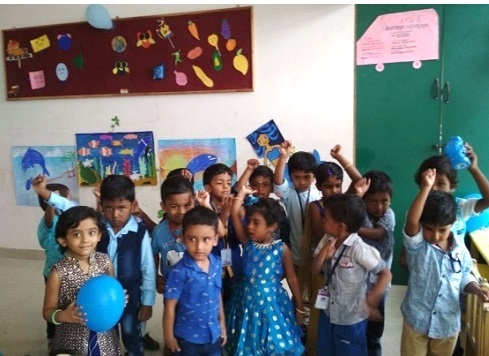 They were given a chance to get acquainted with children from far and wide and also learn crafts like mat making, pillow making and so on. “The quieter the mind, the sharper the intellect.”. 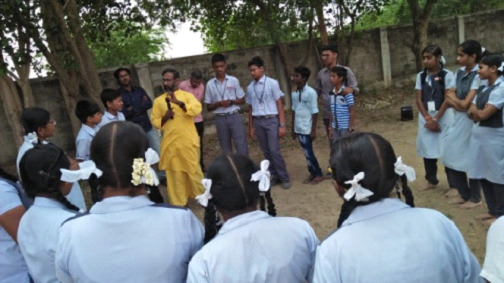 International Yoga Day was celebrated on 21.06.18 at VGN Chinmaya Vidyalaya. 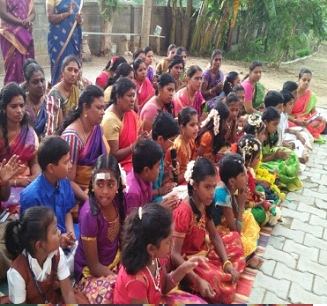 Asanas like Padmasana, Parvadasana, Vajrasana, Eagle Posture, T-Posture, etc. 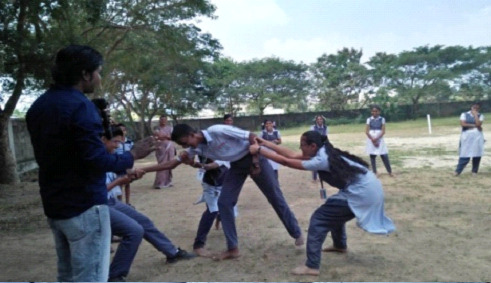 were performed by students of Std. VI. 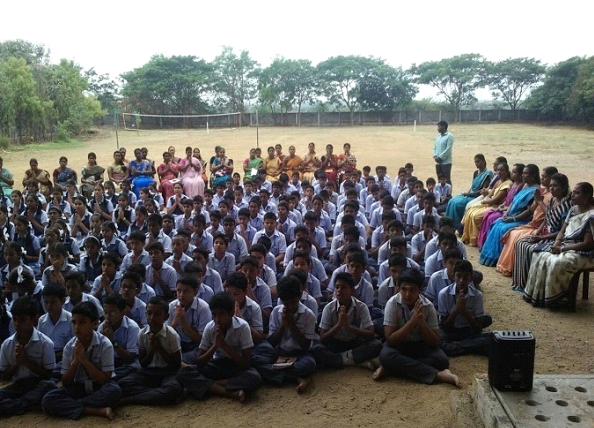 Surya Namaskar was performed extraordinarily by the students. “Spirituality is neither the privilege of the poor nor the luxury of the rich. It is the choice of a wise man”. 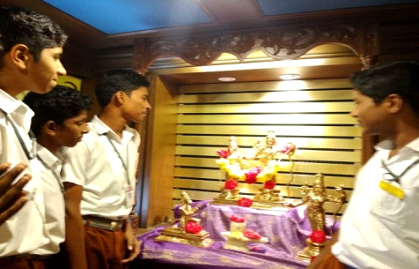 This academic year began with a Spiritual treat for the Mind and Intellect. 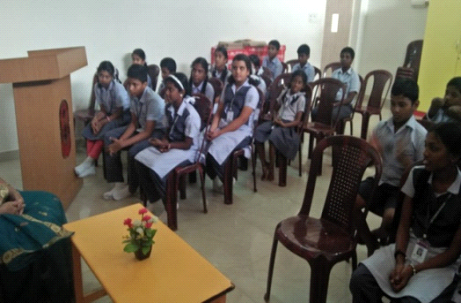 Chinmaya Mission organized a summer camp at Sidhabari. 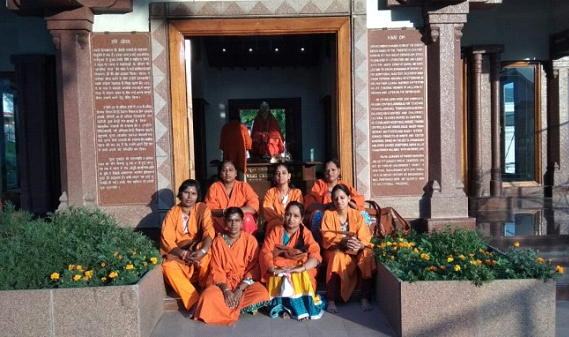 The theme of the camp was to learn about life, values, culture and spirituality under the guidance of Swami Mitranandaji. 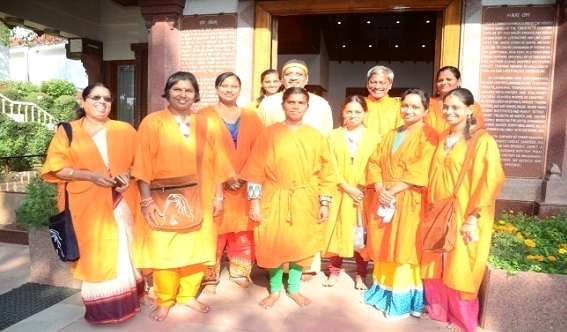 Meditation, Vedic Chanting, Paduka Pooja and visit to CORD. 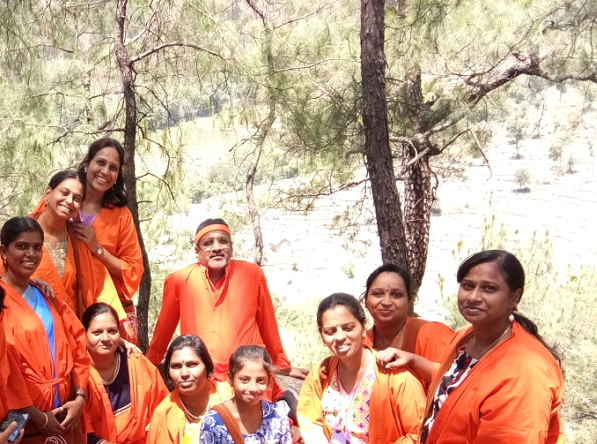 Teachers from our vidyalaya took part in the camp. It is such a vibrant place where the mind and intellect integrate. 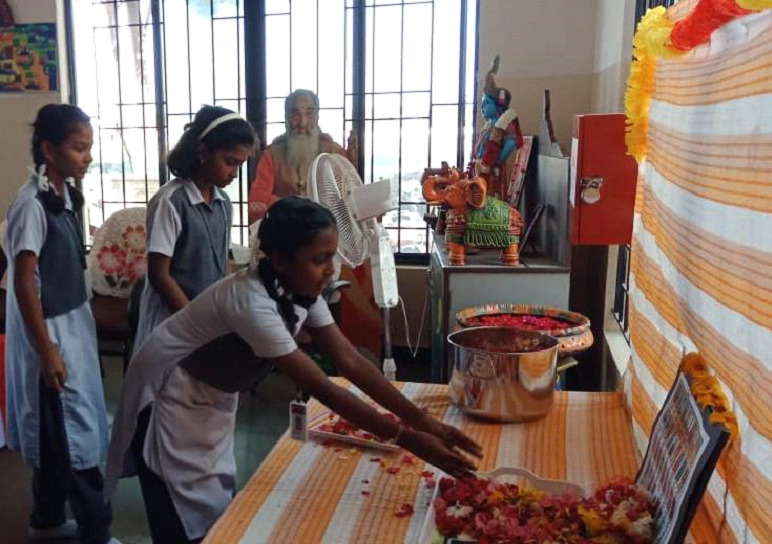 After the vacation, the school reopened with a positive note - Ganapathy Homam on 04.06.18 at the Ganapathy Shrine in our school premises. 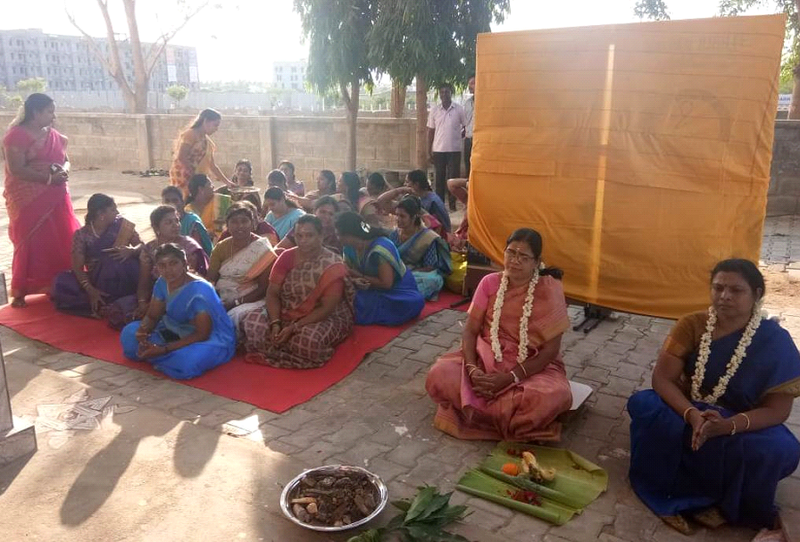 As an auspicious beginning special prayers were offered for the school’s welfare, the health and well-being of all the staff and students and for the over-all development of the school. 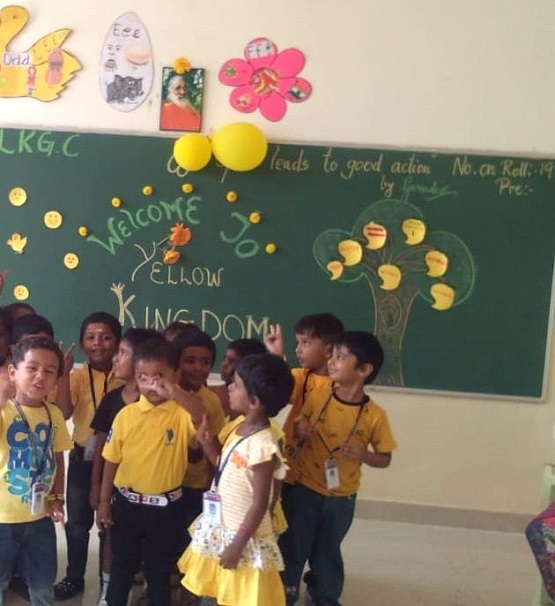 Every Thursday’s assembly is done by the KG children. 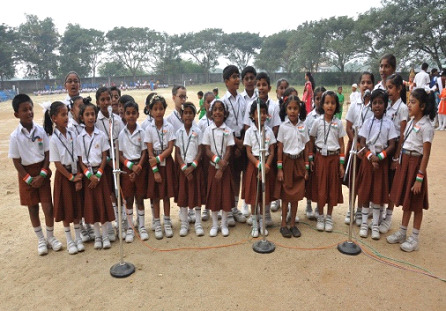 The KG wing boasts of a choir to lead the assembly. 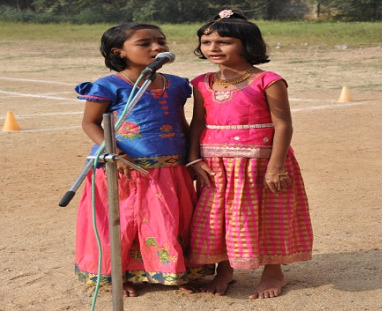 Geeta chanting, Bhajans and shlokas with respect to the various festivals and occasions are rendered beautifully and piously by the kids. 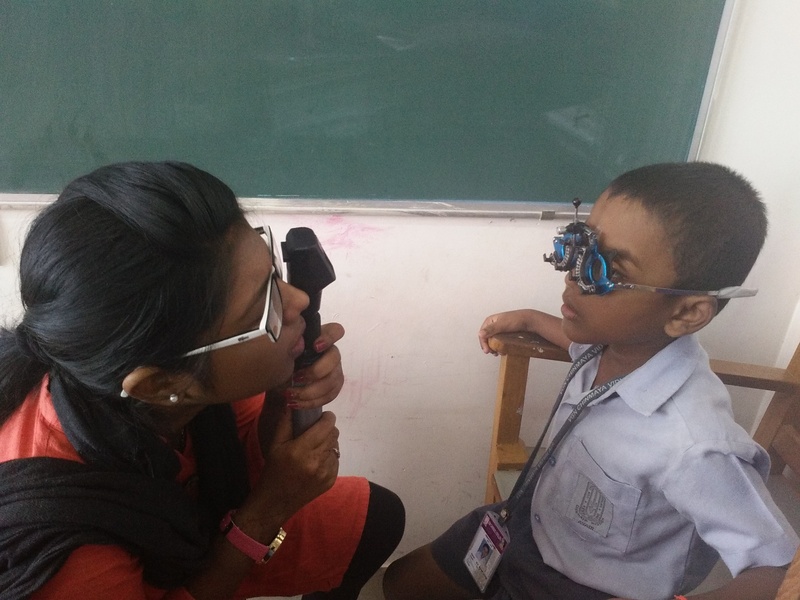 The next step towards health and hygiene after the dental camp that was taken was the Eye-screening camp by a crew of efficient ophthalmologists and interns from Ramachandra Hospital for our students and teachers on 27.11.17 and 28.11.17. 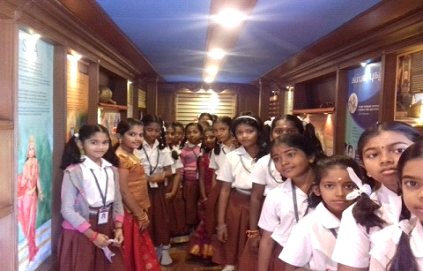 Their sincere service was appreciable and valid. 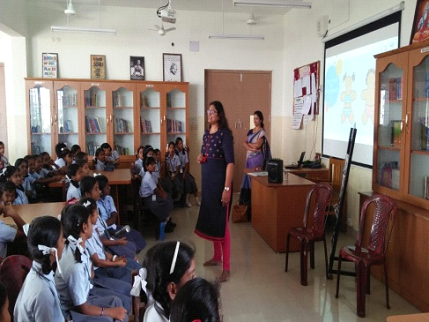 It helped out many students who had vision complexity and other symptoms too. 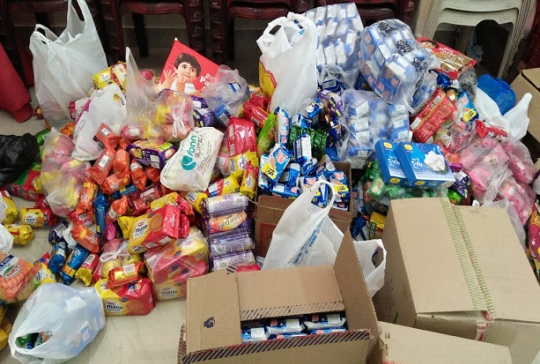 Many of the reasons and remedies that they meted out were an eye-opening. 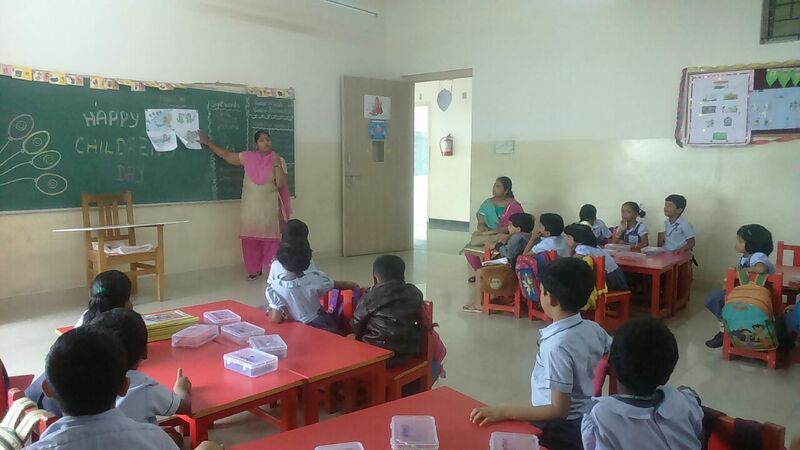 One of the planks that bridged the parents with the teachers is “Sharing Class”. 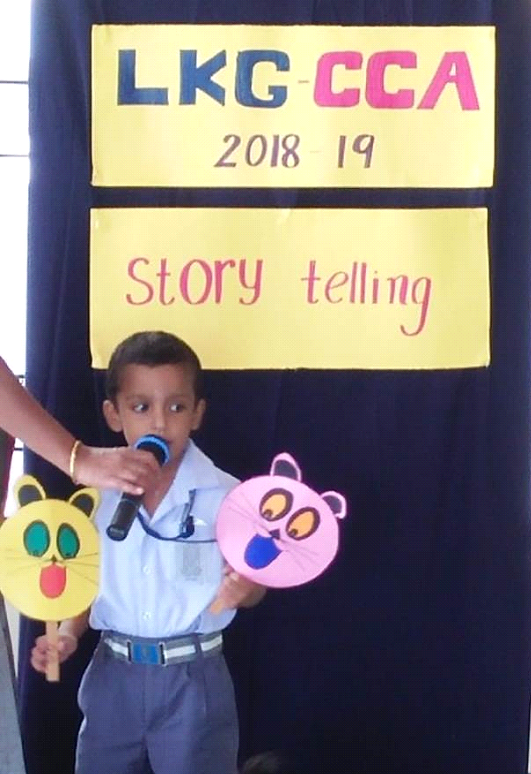 Some of our KG Parents were extended an invitation to share the “Story – Telling Session” with the teachers for the KG classes on the Children’s Day. 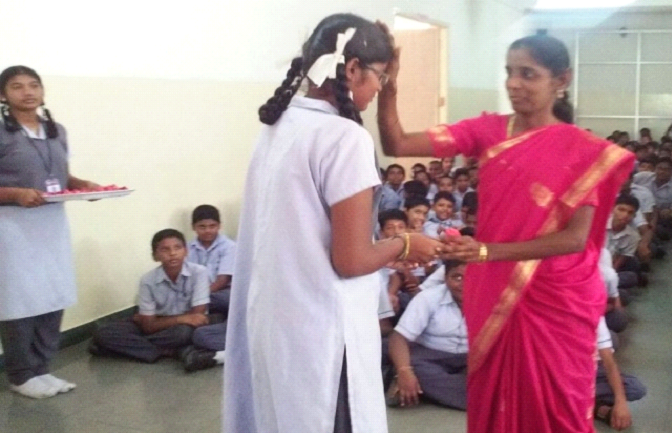 It was a new yet resourceful step towards the re-defining of the Parent-Teacher-Bond. “Knowledge is free at the Library. Just bring your Container.” In accordance with the above quote, the library- visiting habit is inculcated at the KG Level by giving a free choice of interesting books on Tales, Stories, Word Building, Hands on Activities, Drawing and Colouring that are kept in store at the KG Library to the children. 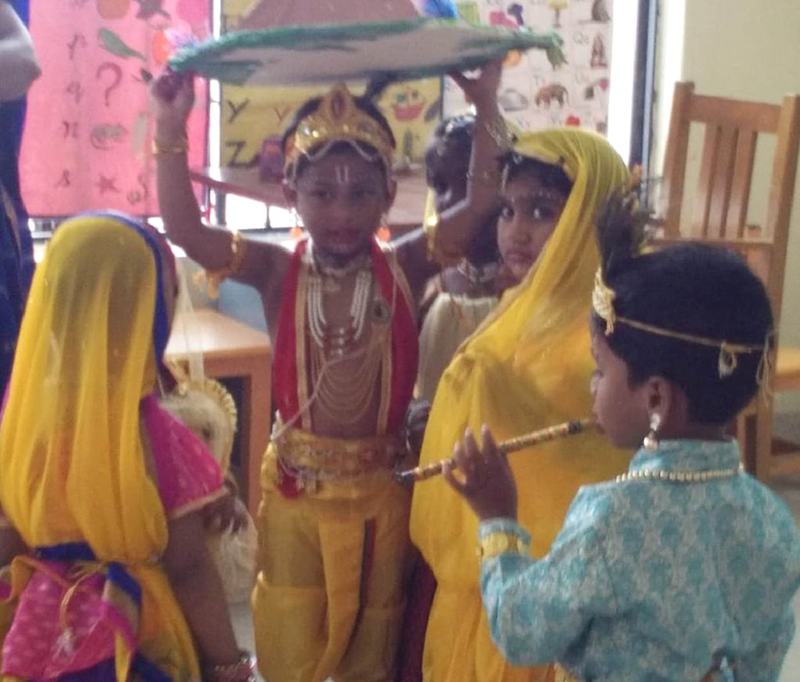 Chinmaya Mission, International celebrates and reveres this day and deem it very auspicious and a privilege. 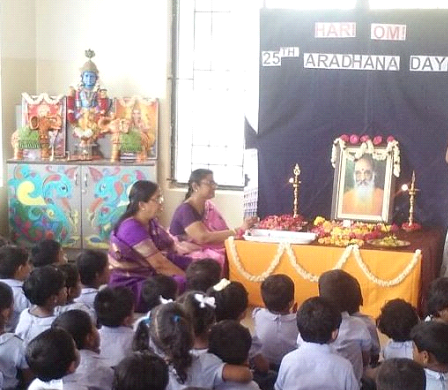 On this day during the morning assembly, the children were oriented the importance of the day. 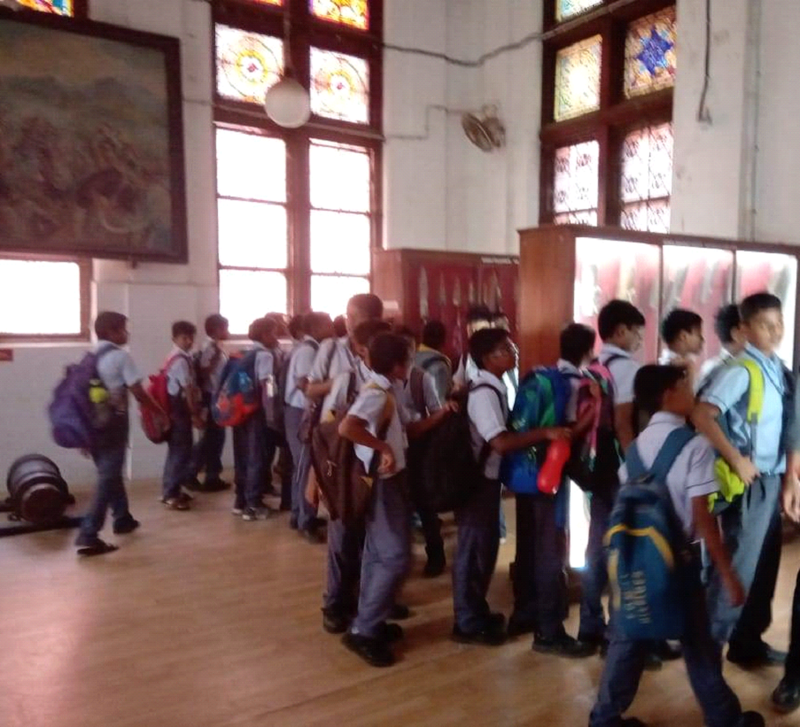 The IXth Standard students who attended the “GEETA FOR YUVA” camp at the Heritage Centre by Swami Mitranandaji, imparted the values to students of classes VI & VII on the same day. 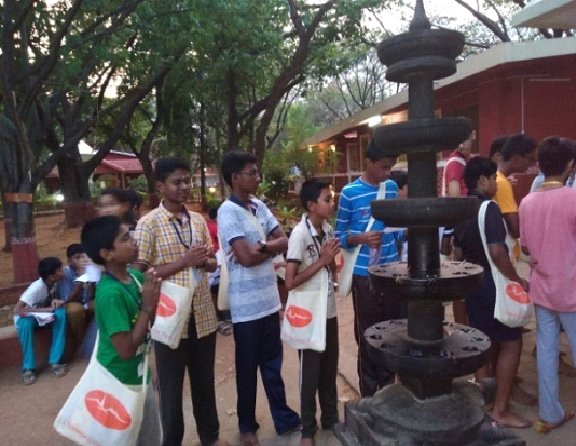 Our vidyalaya was a part of the mega event, when the 12th chapter of Gita was chanted globally at the Chinmaya centres at 6:00 pm. 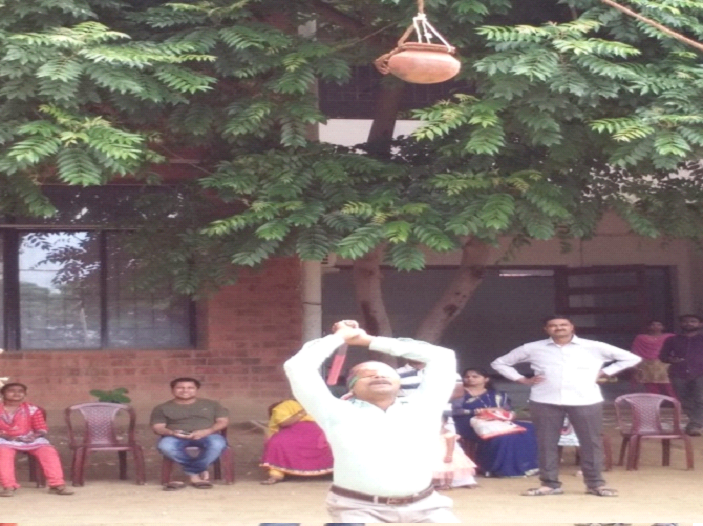 The management, teachers, students and parents gave a vibrant participation. 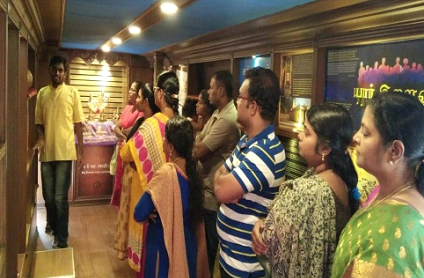 The event included Bhajans, Tapovan Astothra Namavali, Tapovan ashtakam, Gita chanting, Bhagavad Gita Aarti and Prasad to conclude. 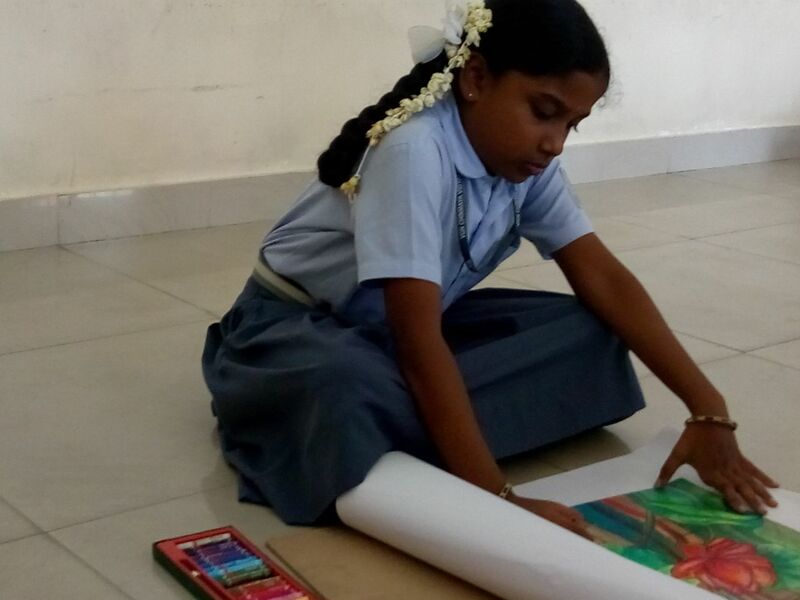 R. Nithya sree of IV – A and R. Rithesh of VI – A have won the first and the third rank respectively in the Colouring Competition conducted by Rangotsav. 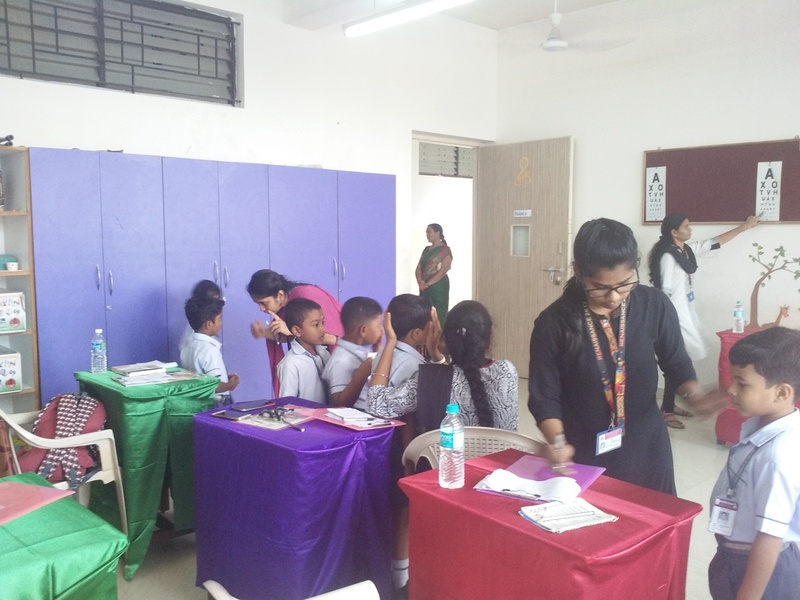 This year 2017, the Student – Behavioural Counselling session was set on wheels in our school on 15.11.17, with the guidance of a reputed Children-Counsellor – Soshina, helping the students come out with their talents and potentials. The visit is made twice a week. 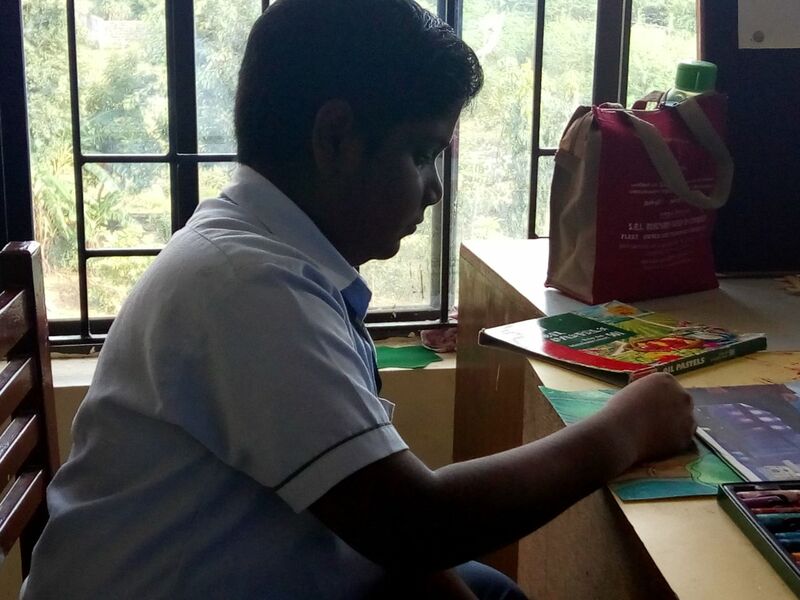 The counselling is done for a class both collectively and individually and some parents are also invited to extend the counselling. 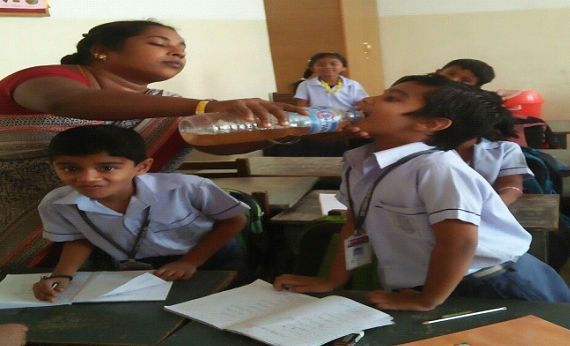 Students at last resort to a confidante, who would help them out of their complexities. 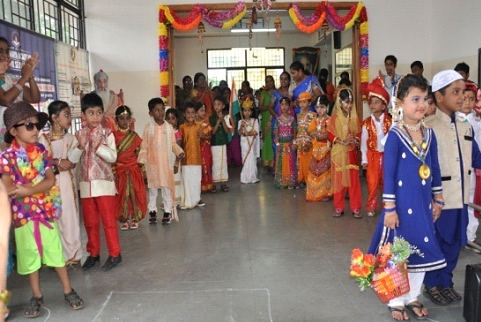 The Children on their day, (Children’s Day) were made to feel the fun and importance of the day by exposing them to various cheerful sessions viz., KG and Classes I and II had fun with cartoon videos; Class III were given a chance to play traditional games such as Dhaayam, Five Stones, Pandi, Chess; Class IV had merriment with Treasure Hunt; Class V came out with extraordinary session of entertainment – Talent Show, swiping away the spectators; Class VI were passively and colourfully engaged with painting the different leelas of Krishna. 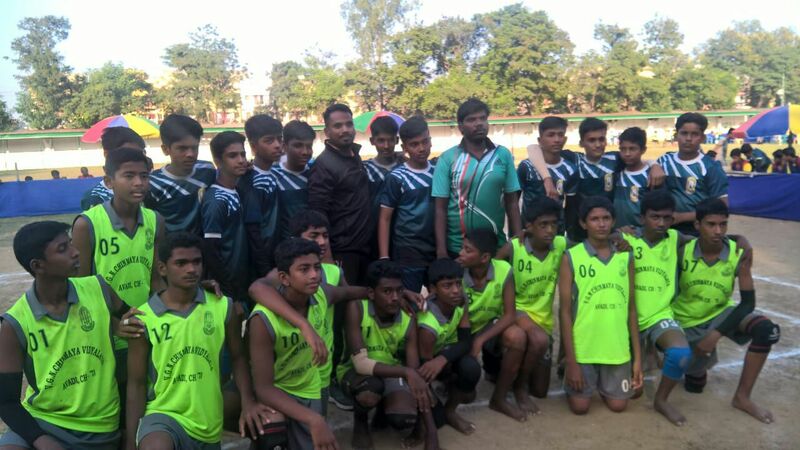 Our school students participated in the 7th Khel Milan all Chinmaya Inter –school kabadi tournament at Bokaro Steel City, Jharkhand during 03.11.17 – 05.11.17 under 16 Boys category. 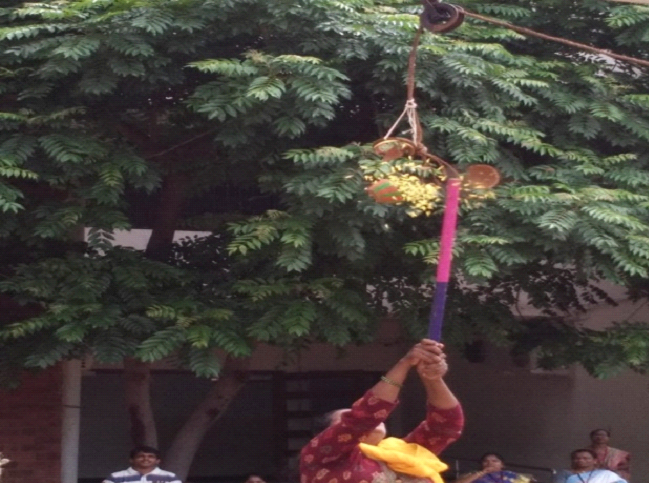 Vanprastha is an exclusive study class for the grandparents, helping them to age gracefully and spiritually. 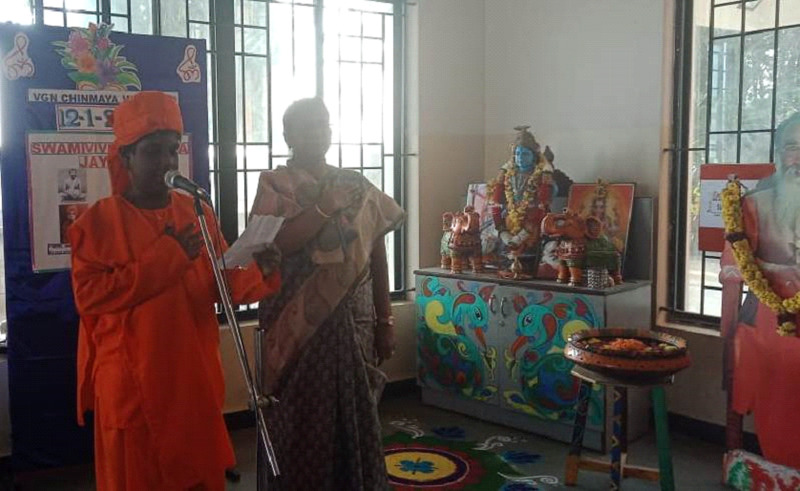 The grandparents attend a study class on one Sunday per month inclusive of trips to Thamaraipakkam, orientation by Smt. 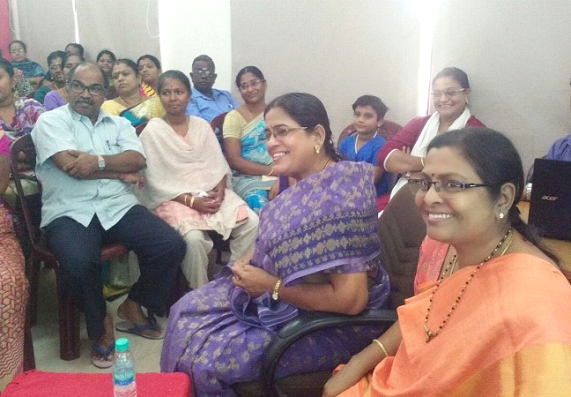 Jayanthi amma and other experts. 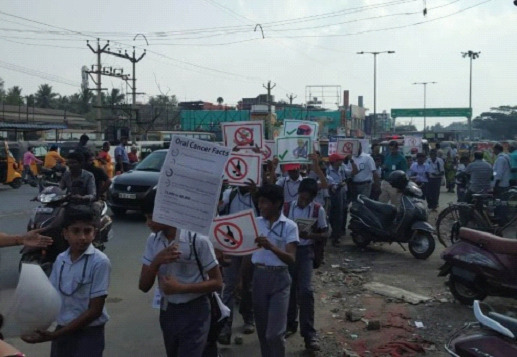 Their participation is a healthy sign.